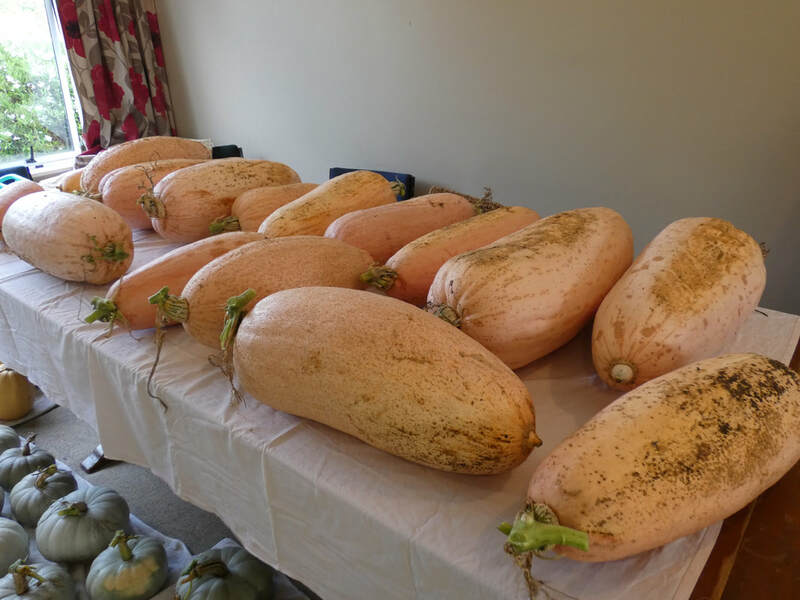 This past summer, I grew pumpkins/squash in different fashion than I ever have before, and the results were outstanding! 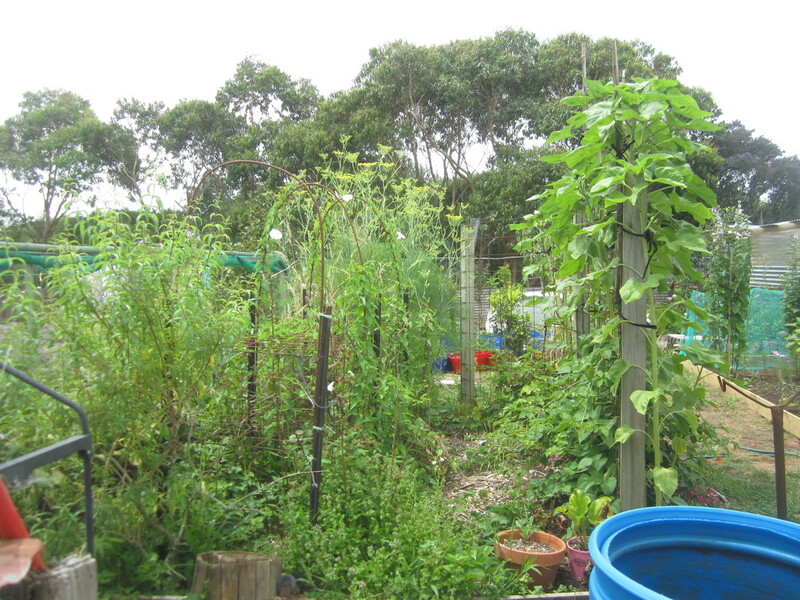 The garden areas around our house are somewhat divided up. Adjacent to the driveway as you enter the yard, there is an area that was once our front lawn. 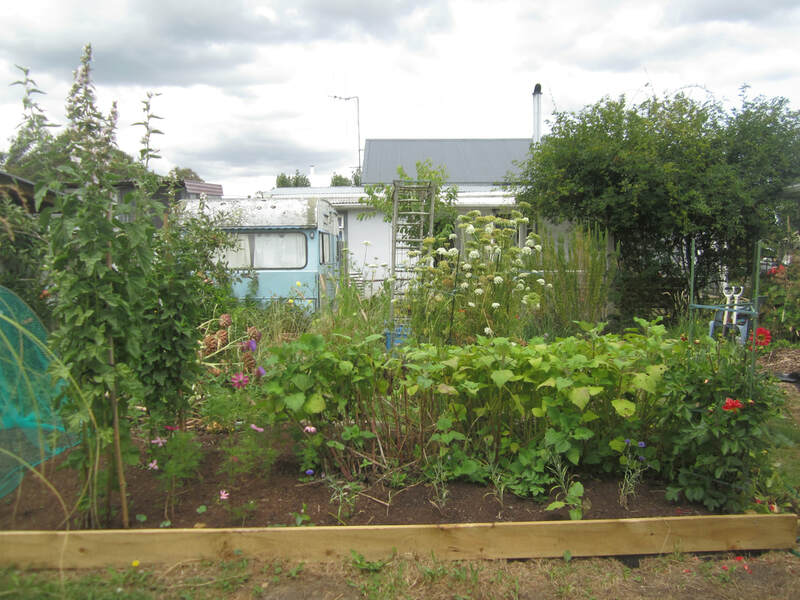 When I got serious about gardening beginning with my decision to grow 1000kg of vegetables in 2013, I dug up three strips in that lawn and planted sweetcorn. The area was, however, low lying and prone to flooding, so not much good for growing except in summer. 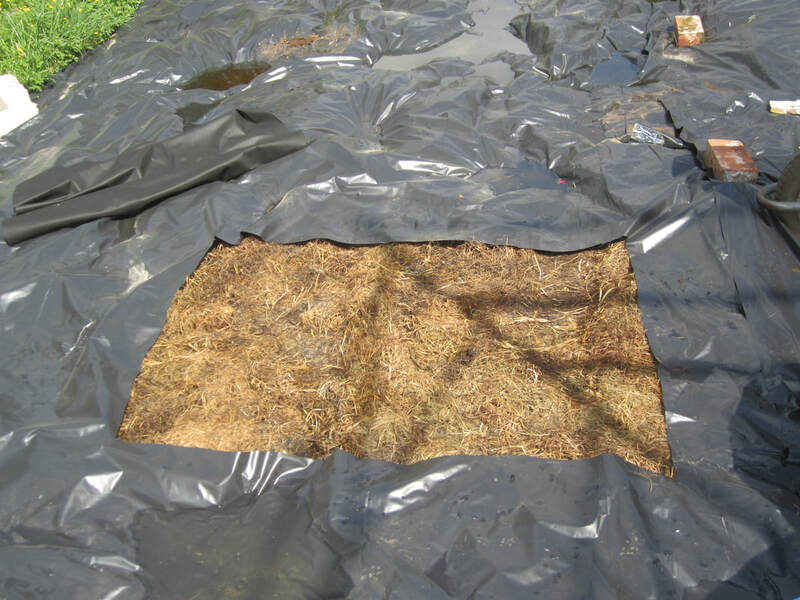 The following season, my kids laid down cardboard all over the area, and spread 18 trailer loads of used sawdust and manure from local horse stables there. 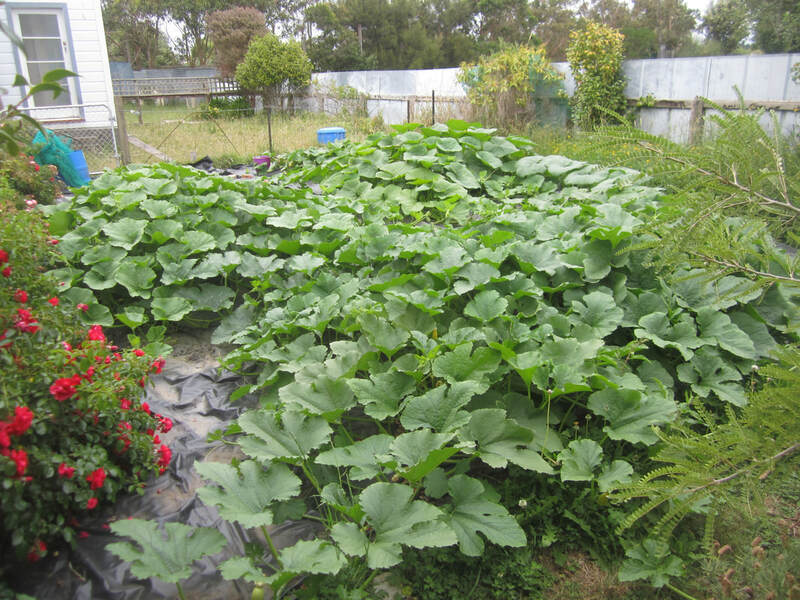 I grew some pumpkins in it, and a few other subsequent crops. 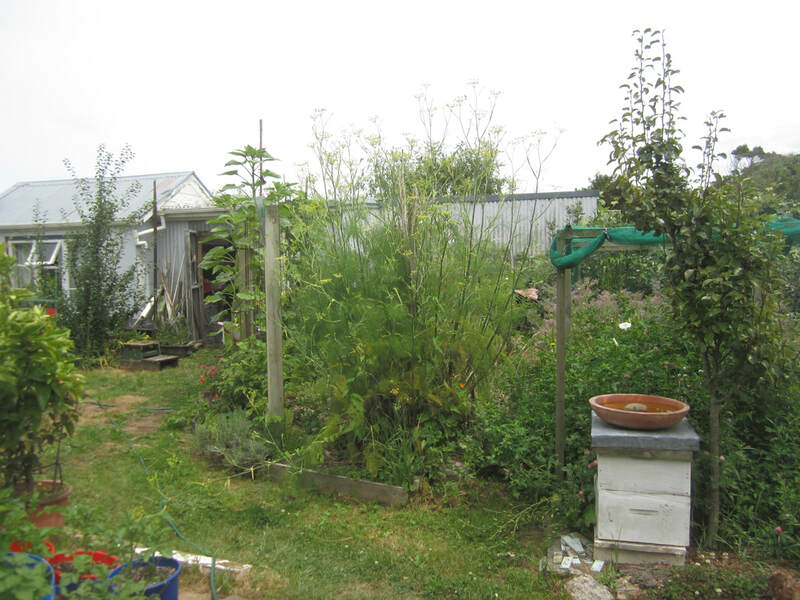 But over time, the couch, buttercup and other weeds took over again, and I always struggled to keep it under control, especially as most of my attention and energy went into my "main garden area," a 300sqm area fenced off behind the house and developed into various beds etc. 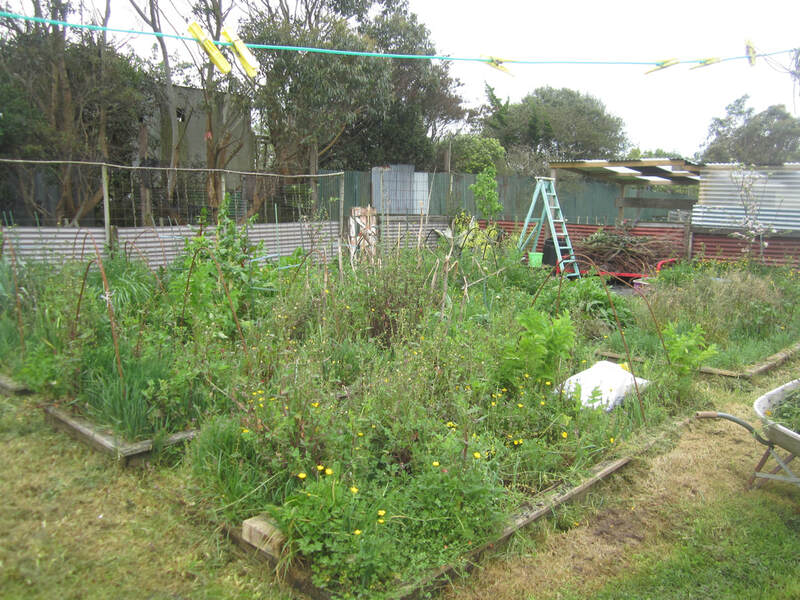 The last couple of years have included a number of life events that have made any gardening at all a challenge, and I was getting very sick of the front garden patch always being waist high in weeds and grass. 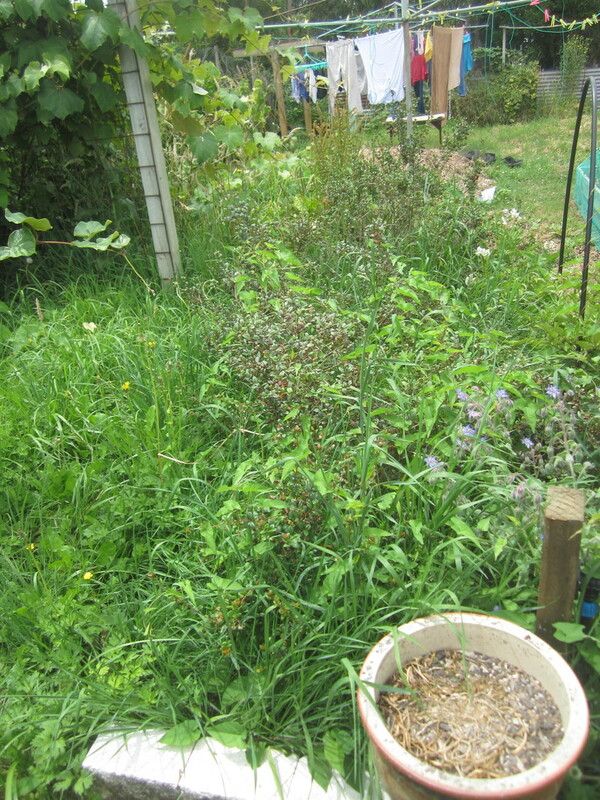 I cut it down with a weed eater every now and then, and kept meaning to just start mowing it regularly and letting it become lawn again, but didn't actually do it. 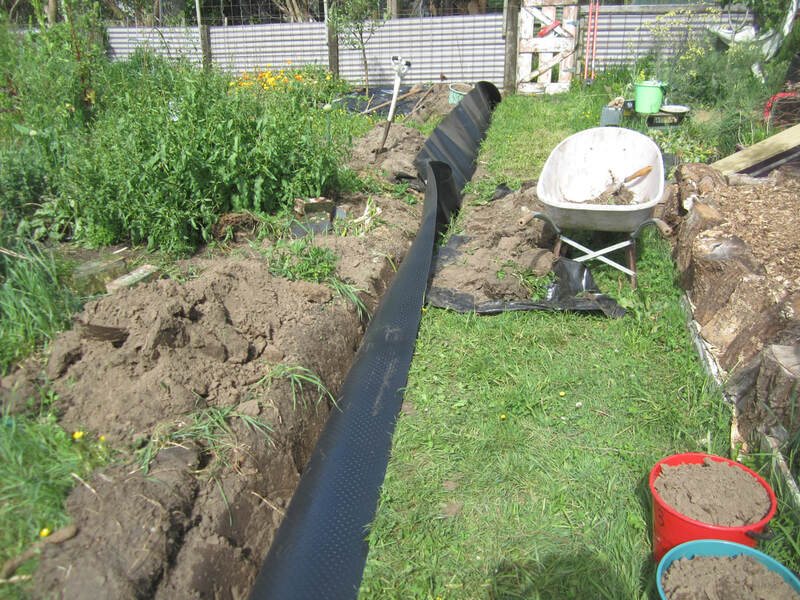 Feeling frustrated and overwhelmed with my current inability to keep on top of everything, I decided I would simply cover the whole area (about 50 square meters) in black plastic over winter, and let it kill off all the grass and weeds, and then lift the plastic and plant for summer. But I was behind in doing that too. 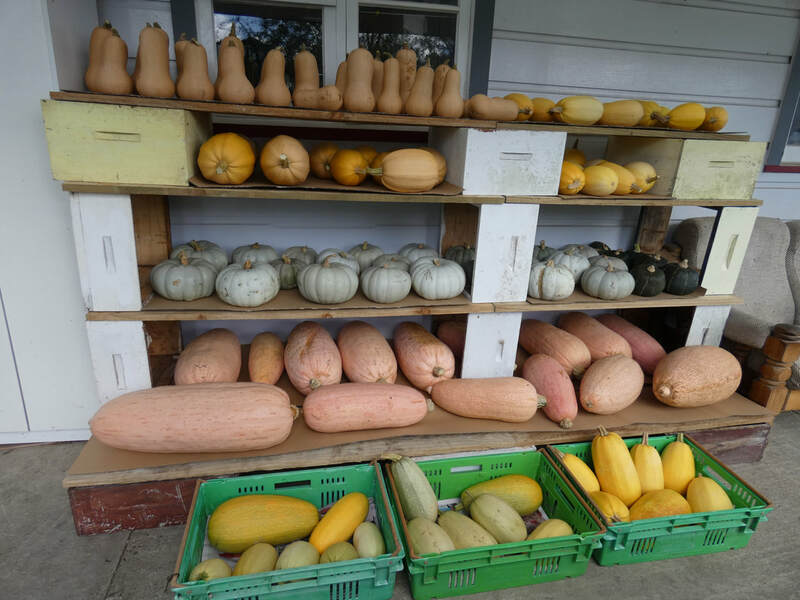 I decided I was going to grow 5 types of "winter squash" (ie pumpkins and squash that are picked fully mature and which store well through winter and beyond - I can usually store them for up to a year, until the next crop is ready). 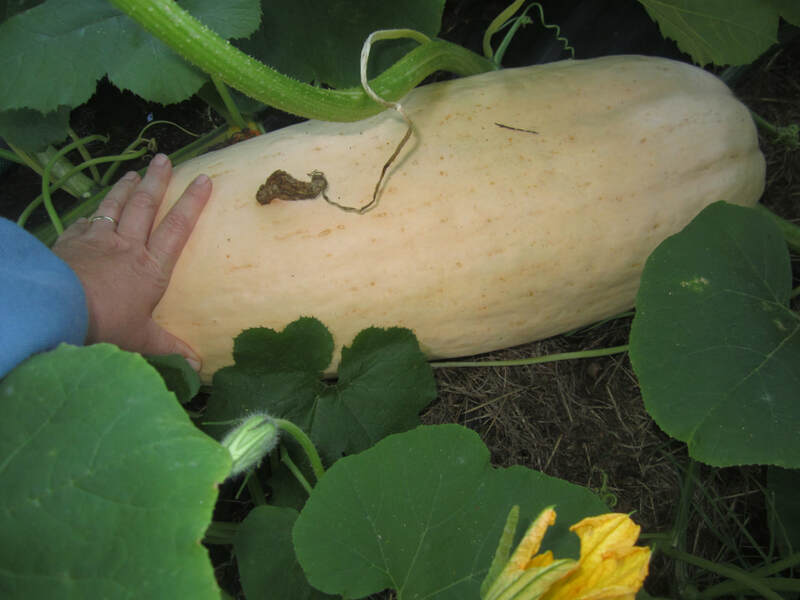 I would grow: pink banana jumbo squash, buttercup squash, crown pumpkins, butternut squash and spaghetti squash. 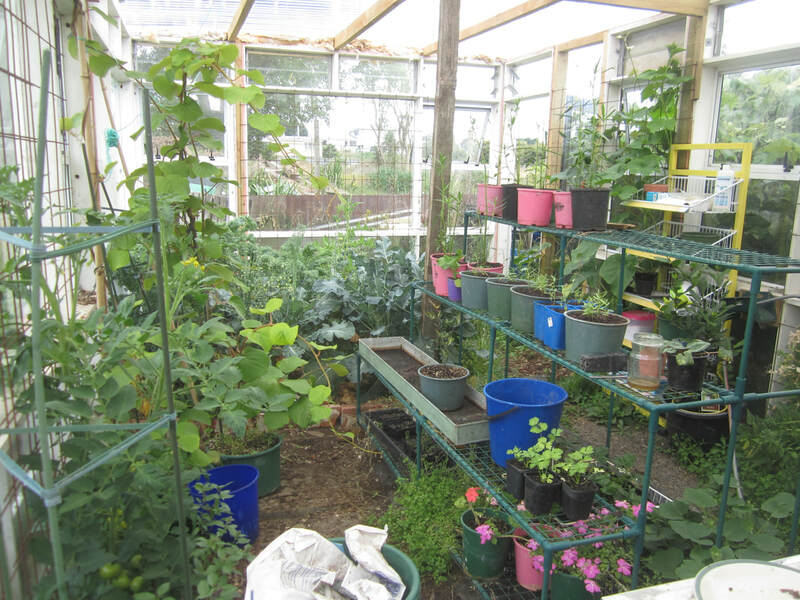 I started them all from seed in my greenhouse (also on 27th Oct), but the buttercups were very slow to get going and so were kept in the greenhouse for longer. 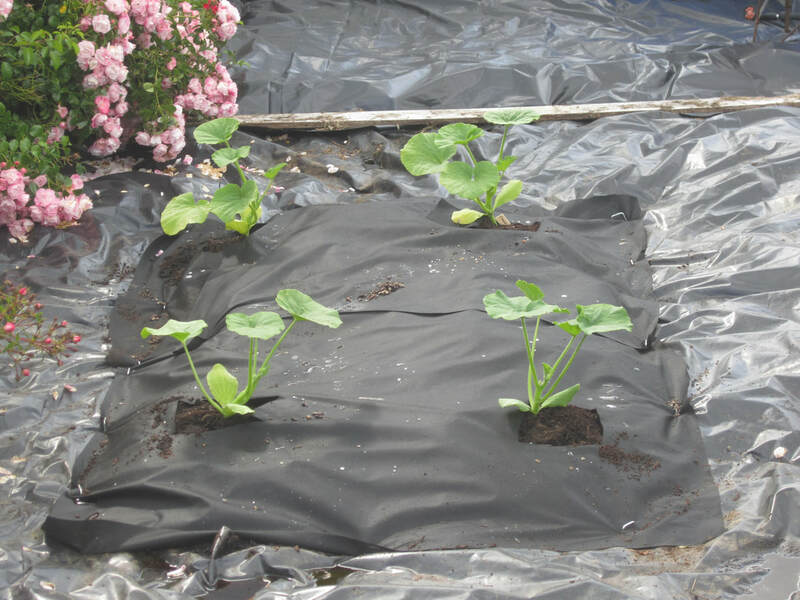 When most of the seedlings were ready to plant out, I cut big squares/rectangles out of the black plastic, one for each variety of squash, suitably spaced out. 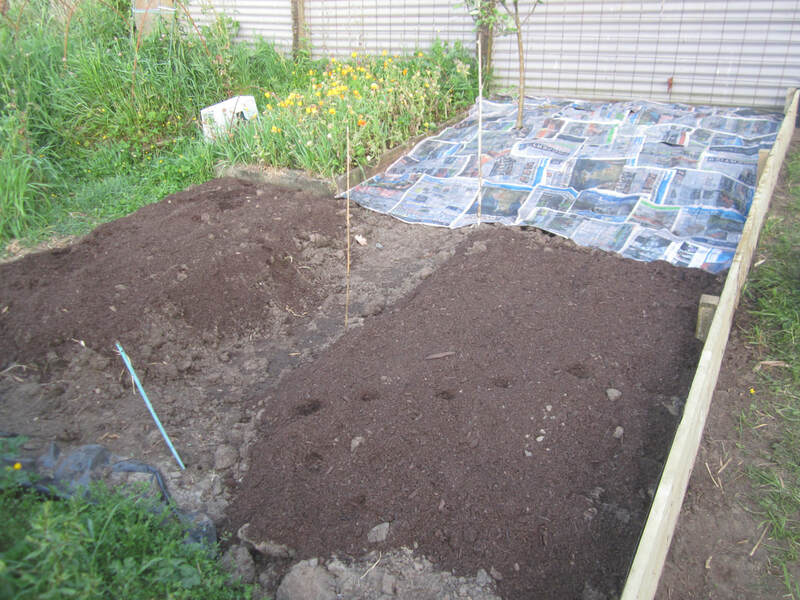 Into each square, I poured 1-2 wheelbarrows of compost, and spread it over the space in a mound. 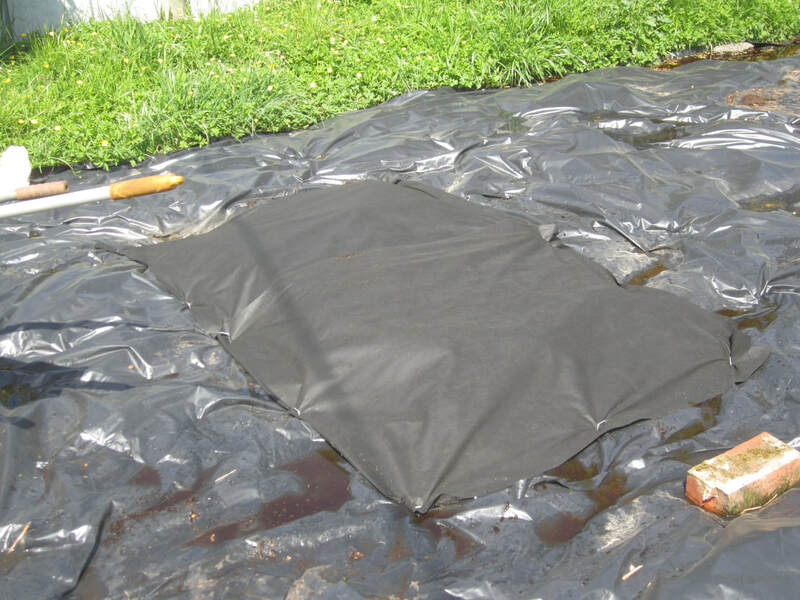 I then laid weedmat over the compost, and pinned it down, making sure that the plastic underlapped the weedmat in such a way that any rain on the surface would run into the compost, hopefully. 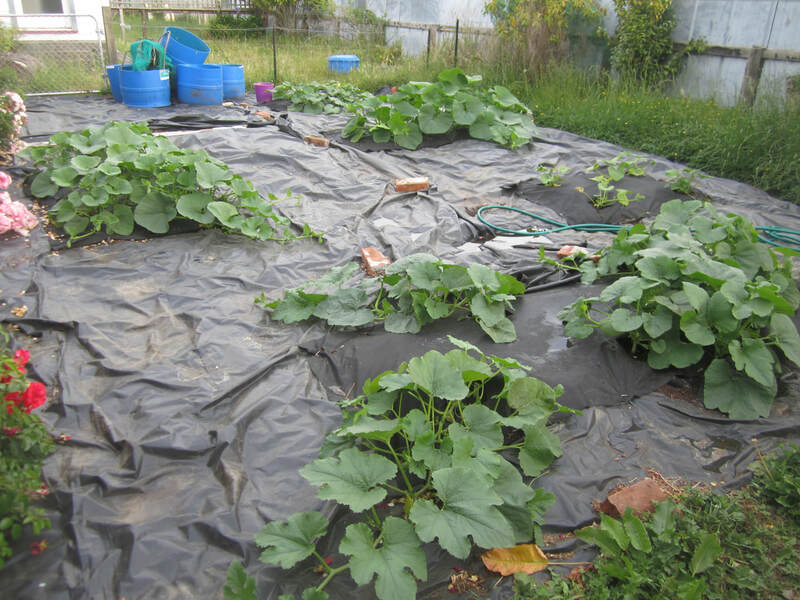 I then planted out 4 crown pumpkins in one patch, cutting holes in the weedmat, 3 pink banana jumbos in another, 4 butternut squash in another, and 6 spaghetti squash in a long row at the leading edge of the area. A patch was ready for the buttercups too, but they went in two weeks later. 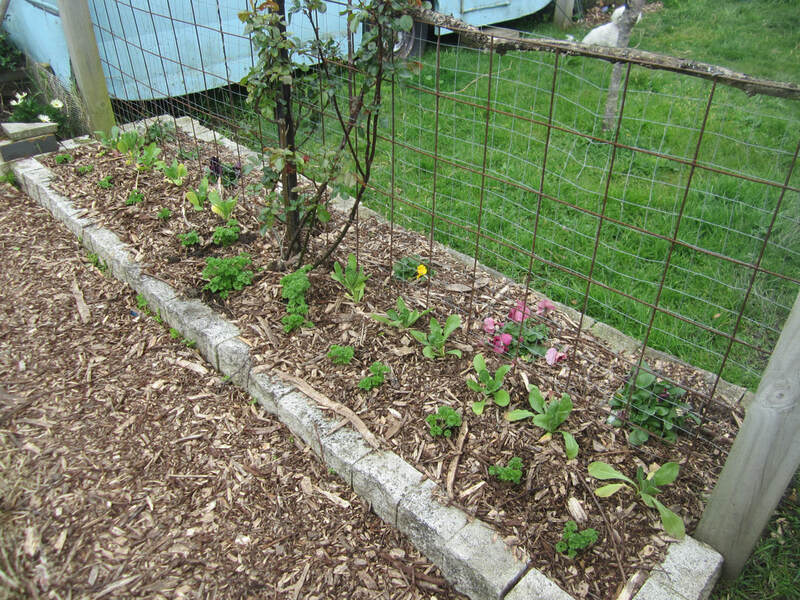 Most of the seedlings were planted on December 3rd; the 5 buttercups were planted on the 14th. December was BLAZING hot - the hottest summer weather we've had in years. 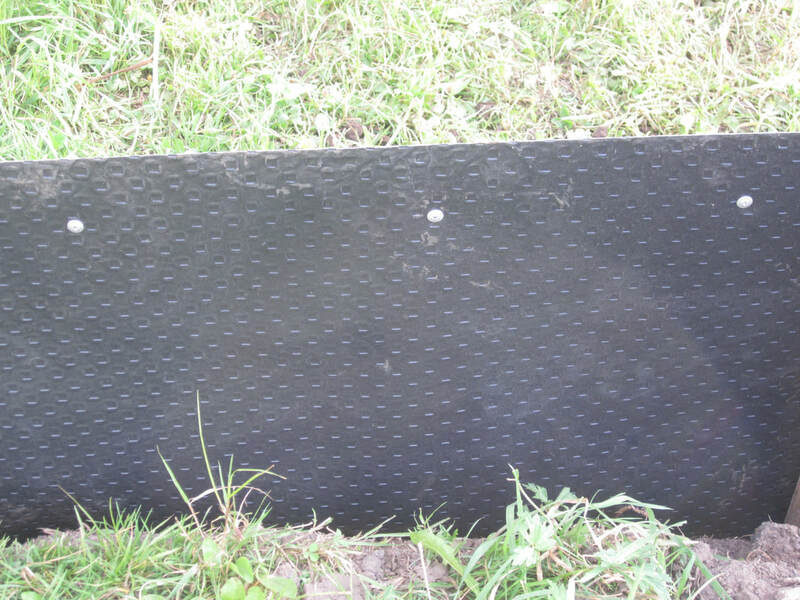 The plastic heated up to the point that you could not walk on it. 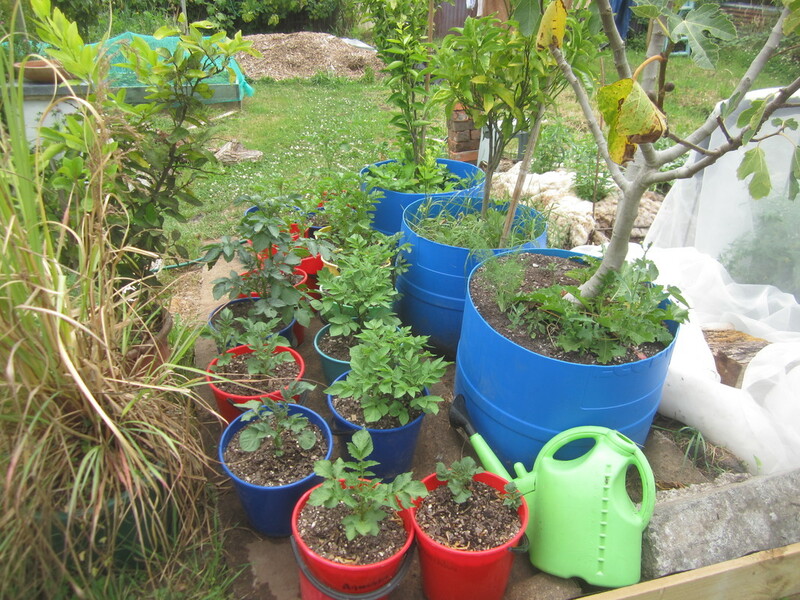 I watered the seedlings at the base of each every day for a couple of weeks - twice a day the first few days - and then every other day for another week or so. Then we had a some rain. 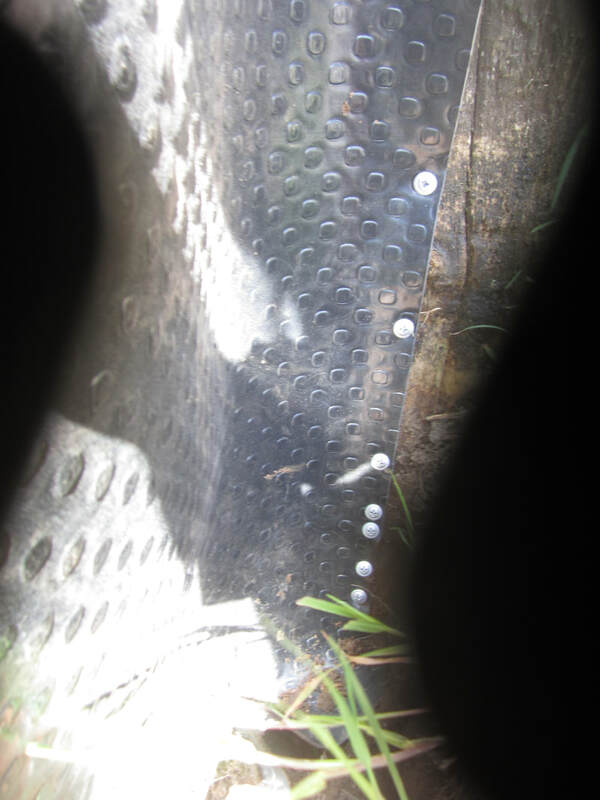 I went over the patch after that, and any spots were water was pooling on the plastic, I stabbed holes with a pair of scissors, so water could drain through into the soil. I didn't want it to sit on the surface later and cause the squash to rot. 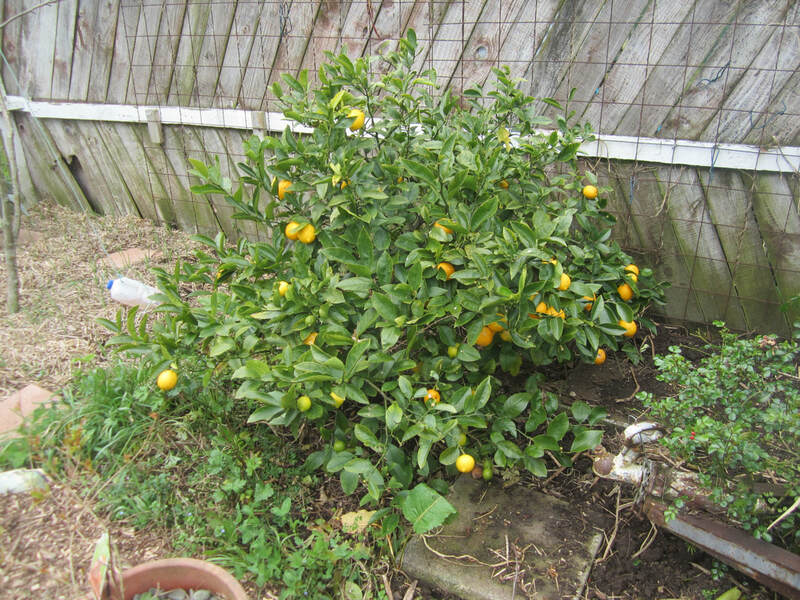 After those first few weeks of watering, I did not water the plants again, or do anything else to them, except to take the occasional photo, and to try and dissuade the spaghetti squash from invading the driveway. They all grew super fast! The heat was obviously a contributor. 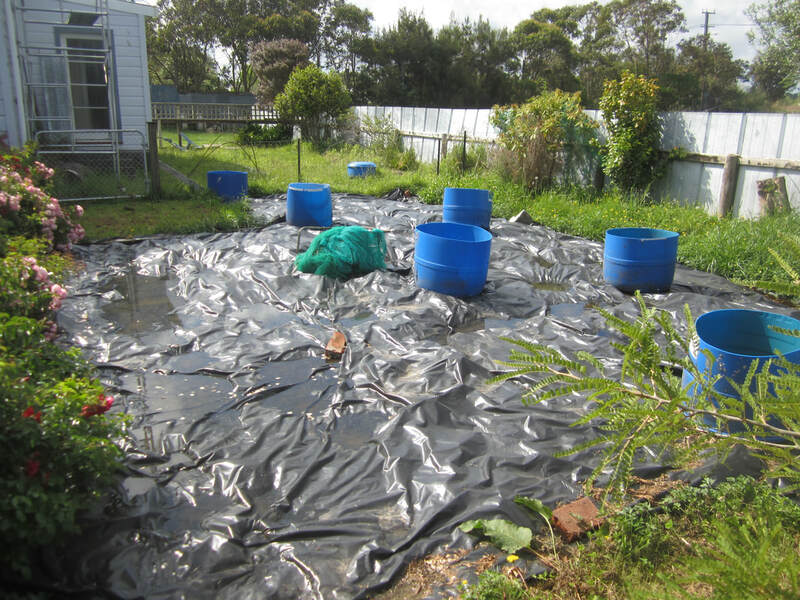 The grass rotting down under the plastic would have provided plenty of extra food also. Here are some progress pics, with dates captioned below. Further down, I will itemize the harvest totals. 20th January. I wonder what's hiding under all those leaves? The foliage is too dense for me to get close enough to really see. 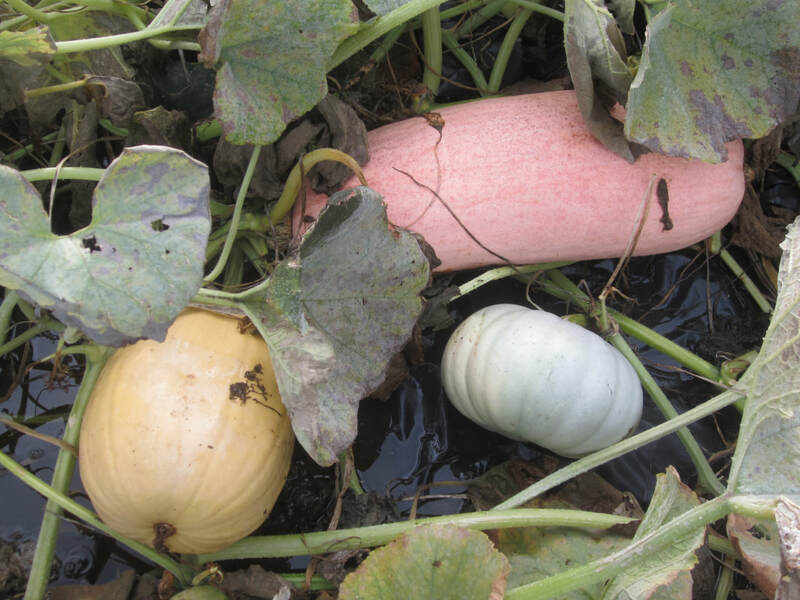 4th February - a pink banana jumbo squash. 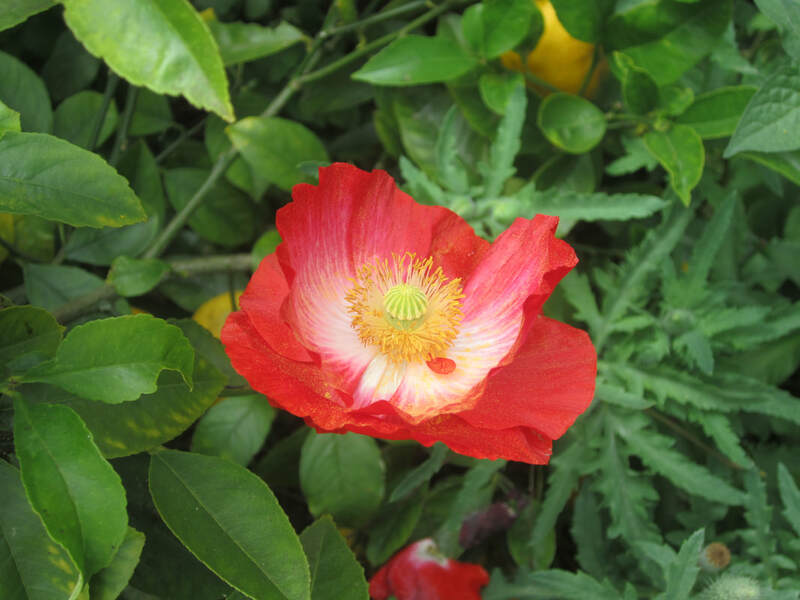 They start out very yellow, and turn more pink as they mature. 26th Feb. The plants are rapidly dying off. This is normal for the time of year, or when the plants are about done, and I don't bother to fight it. With the collapsing of the foliage, I'm starting to see what's been hidden! 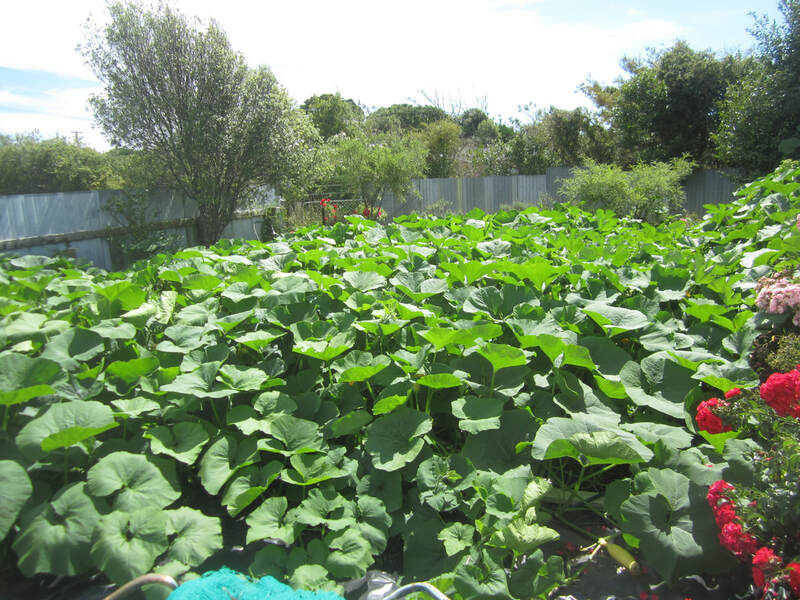 With quite a lot of surface water, I do my best to lift as many squash as possible onto pieces of timber, or slightly higher spots. 15th March. Plants basically dead, though new growth keeps springing up on some of them. 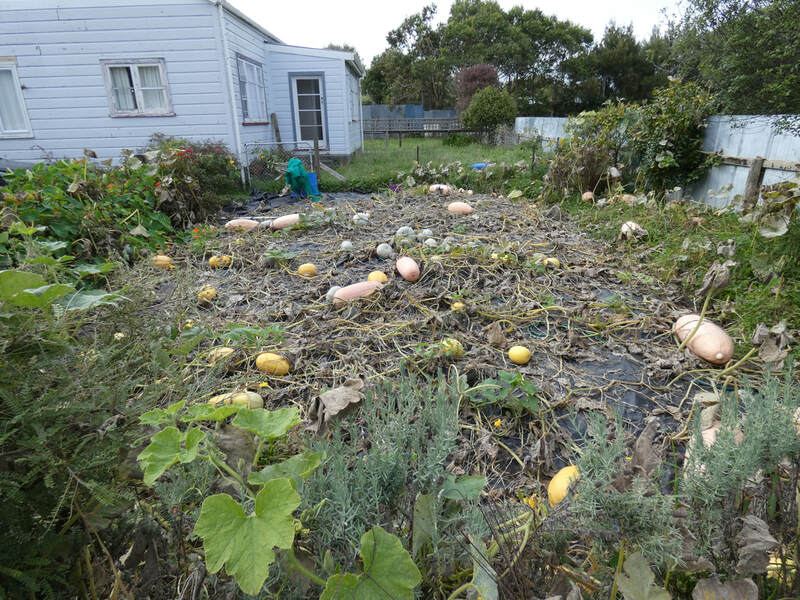 I'm keeping an eye on the stalks of the squash, looking for signs they have dried out (browned) enough to harvest. Finally, on 24th March I decide it's time to harvest them all. 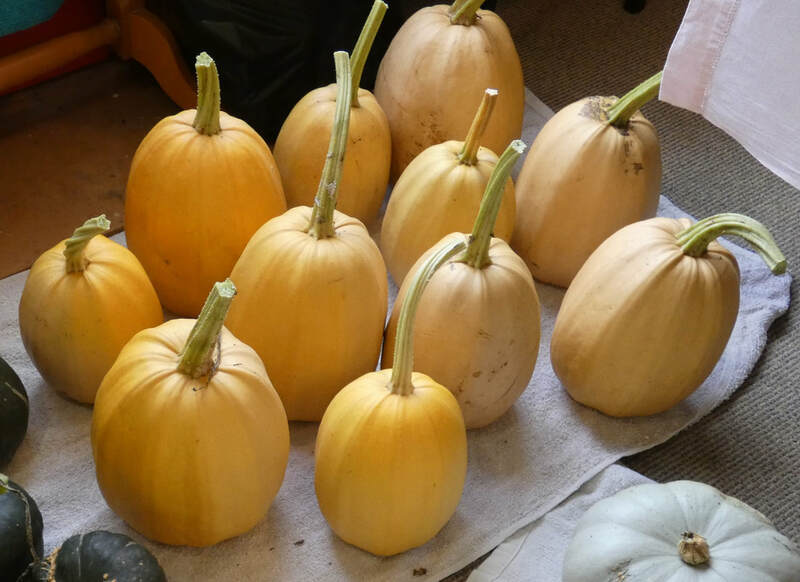 Some of the spaghetti squash are not fully yellowed yet, but I want to clear this space and ready it to plant winter crops (more on that below). Some of the pink banana jumbos are so big, I can only bring in two at a time! 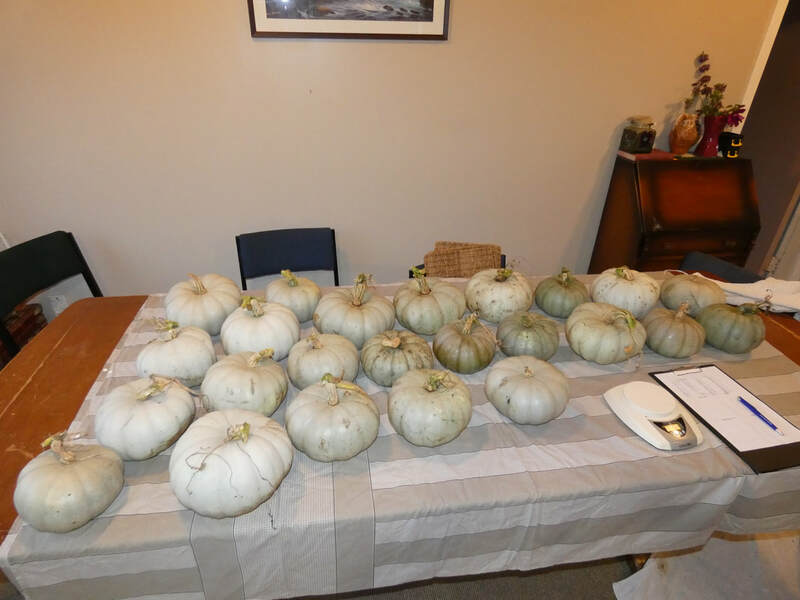 I brought all the squash inside, and laid them out in my dining room, letting them sit for a couple of days for any surface moisture to evaporate. Then I weighed and recorded each one, and wiped them down with a weak vinegar solution to kill any surface fungi that might promote rot. This also caused me to examine each one more carefully. Any that need using up soon I marked with an X, and any with some stem rot I want to keep an eye on, I marked with an S. That way, I know which ones to check most often and use up first. Below are the results for each variety. 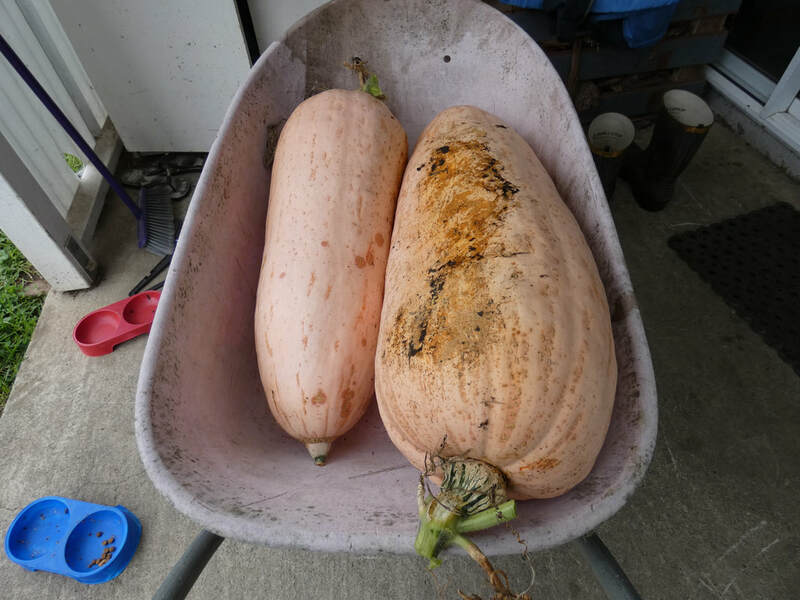 Pink banana jumbo squash start out very yellow, and turn pink as they mature. The flesh is bright orange. It is well flavoured and excellent roasted or for soups. 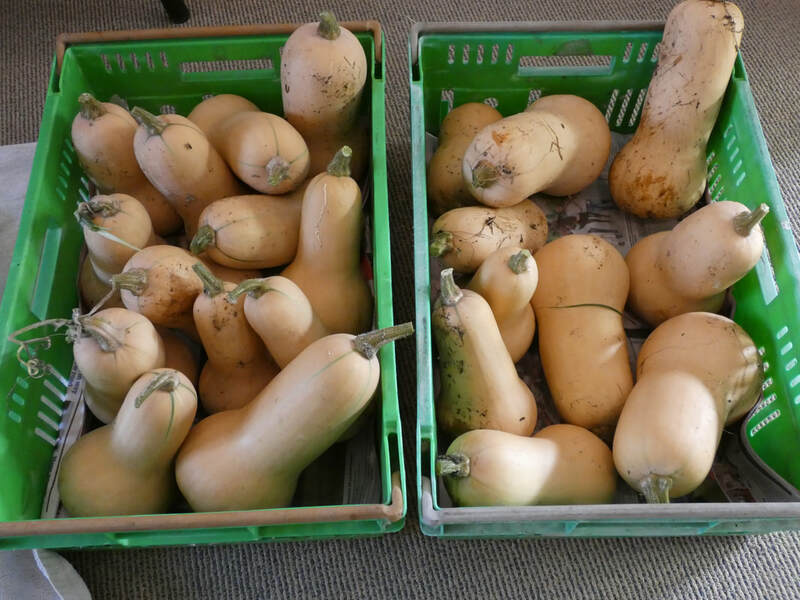 The puree of this squash was commonly used in baking instead of butter during WWII. 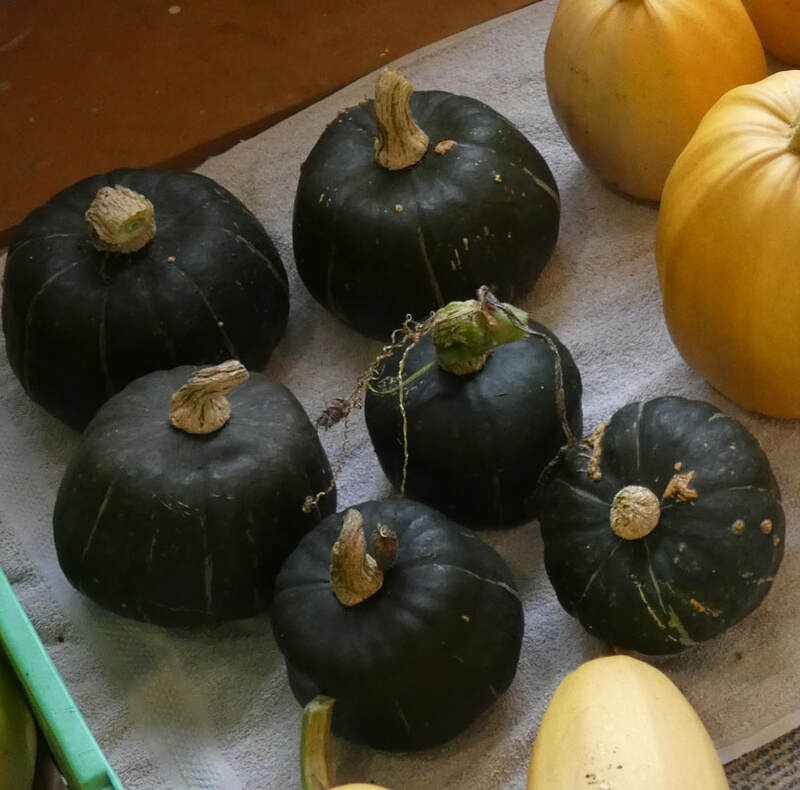 ​Butternut are a lovely sweet squash - the flavour is best after they have been stored for at least a month, as this allows time for the starches to convert to sugars. 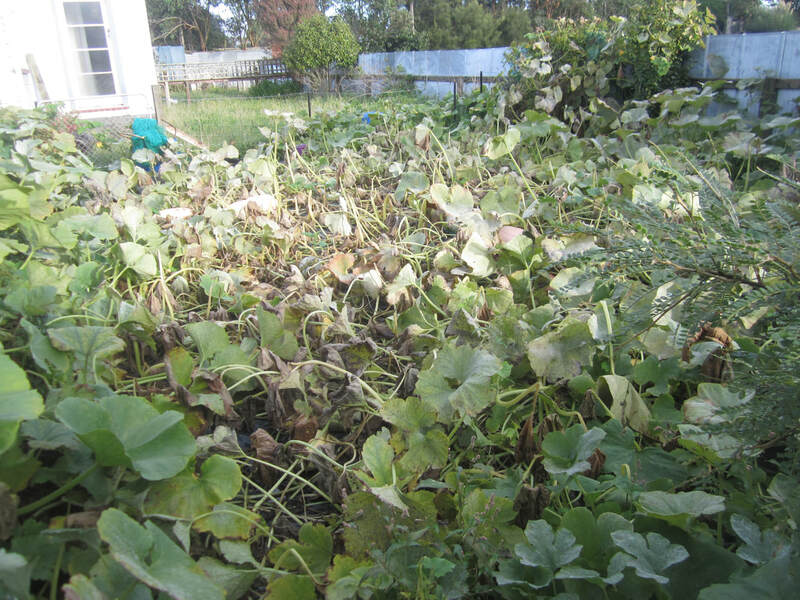 The buttercup squash seedlings were slow to grow, and the plants were very quickly overrun by the other much more vigorous squash. So I wasn't suprised by the small yield. These are Burgess Buttercup, which have quite a blocky shape. 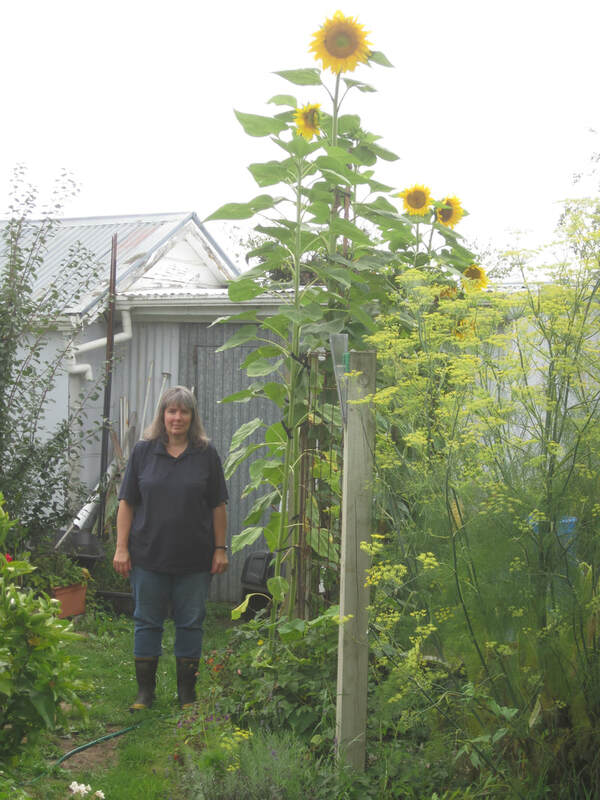 It's the first time I've grown from this particular pack of seeds - it's not looking good for a re-run! 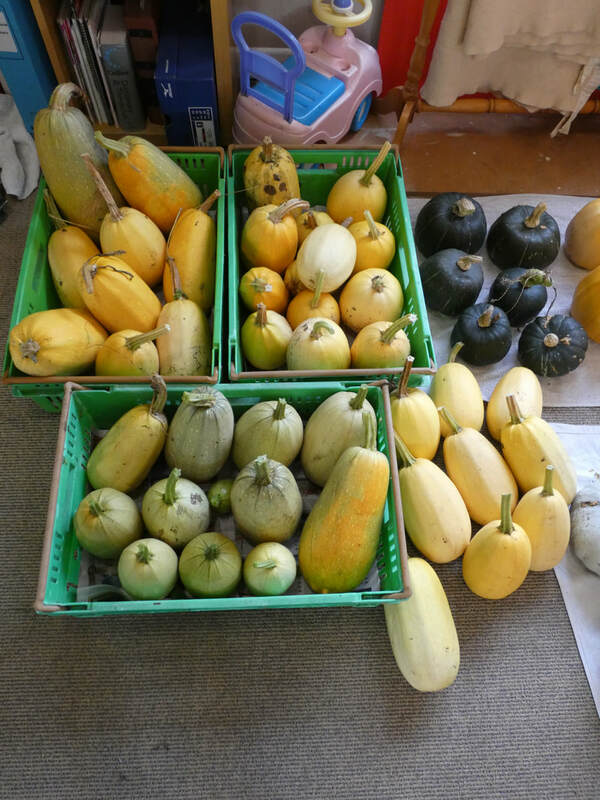 Spaghetti squash are used instead of pasta - cut the squash in half lengthwise, scoop out the seeds. 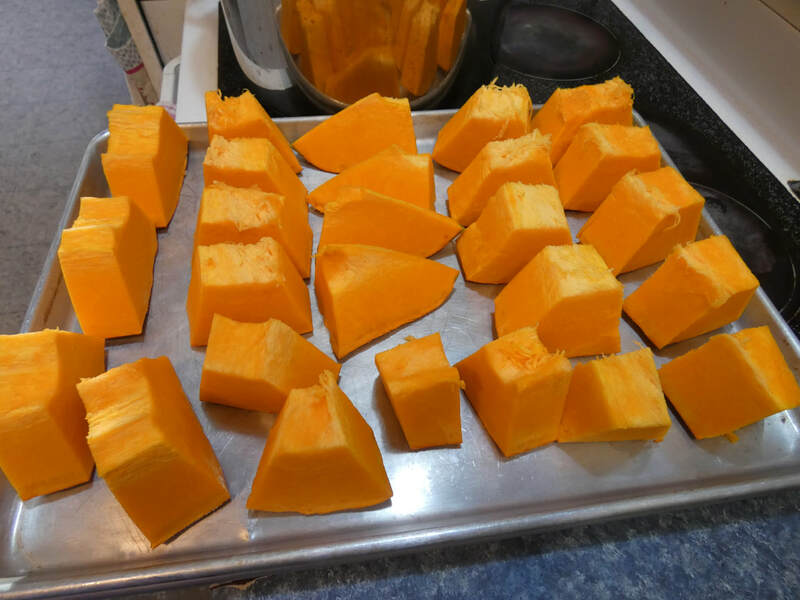 Place squash cut sides down on a baking paper lined tray. Prick all over. Bake 180C for approx 40 mins or until tender. Then pick up one half at a time with a teatowel, and scrape out the flesh with a fork into a bowl. The flesh comes out in spaghetti-like strands. 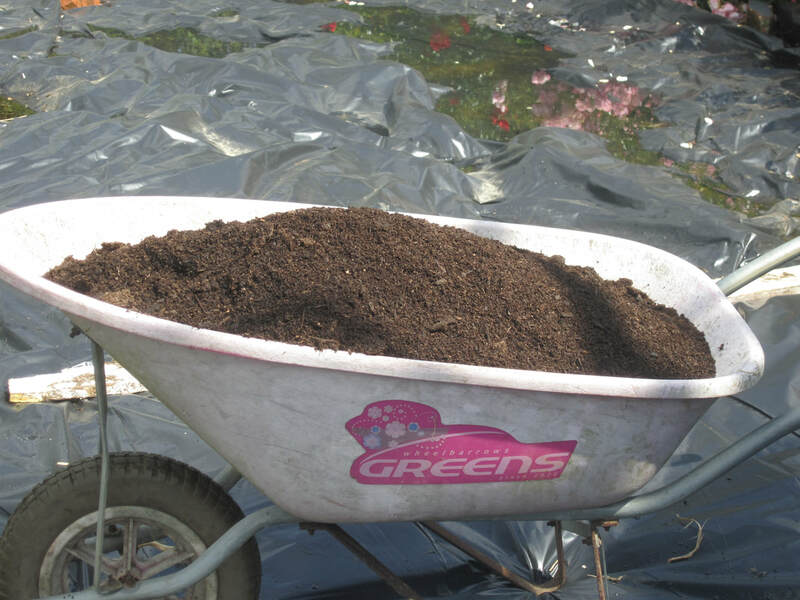 The plastic mulch controversy: There are those who will say that laying down plastic over the soil is a bad idea, because it can sour (kill) the soil so no subsequent crops will grow. This will only happen in certain conditions, and only after more than about 6-7 months on the ground. 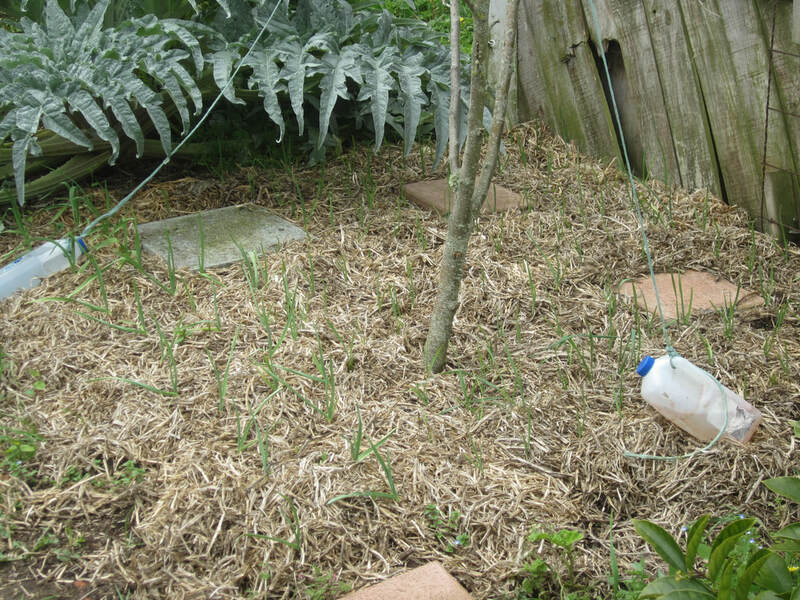 As a short term solution to killing persistent grasses and weeds (solarising), especially for gardeners who are less able to dig for one reason or another, it has it's place. 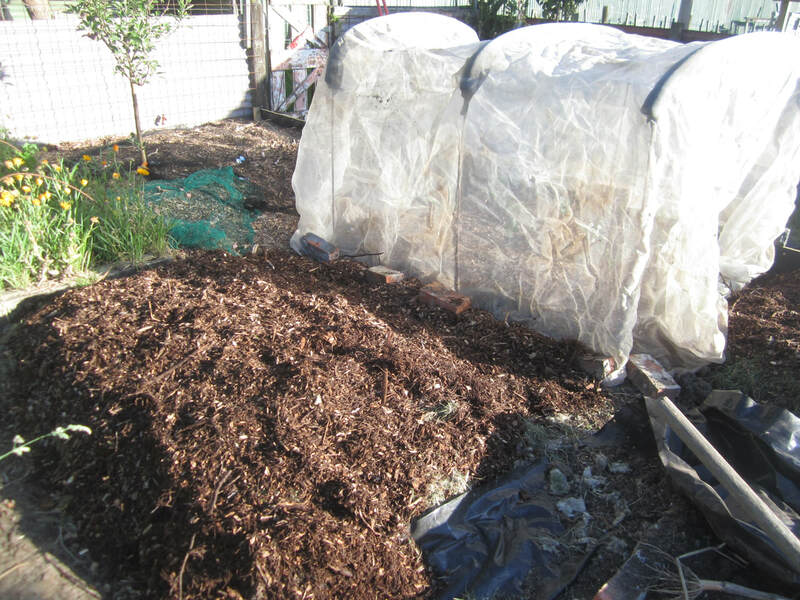 Furthermore, studies have shown that the use of plastic mulch can increase the bioavailability of a number of nutrients, as well as water retention etc. 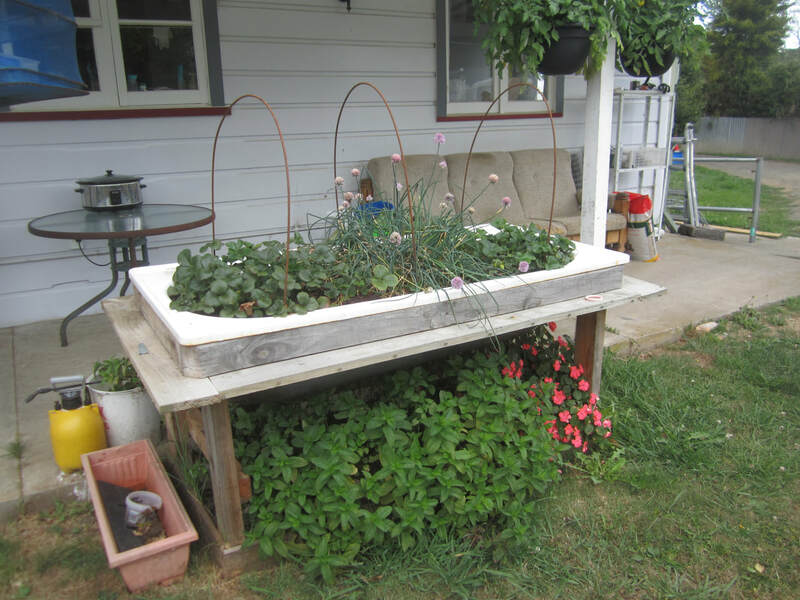 It's still not my preferred way to garden, but as I said, it has it's place. Just how good a yield was it? Just out of interest, I decided to work out what the yield per acre would have been if I'd been growing the same way on a larger scale, with the same results. Answer: 30.6 tons per acre. I looked for commercial crop yield figures, and it would appear that this rate of yield is 2-3 times higher than most commercial crops! Of course, there are huge variables - what is available locally, what they are charging etc. But still, a fun exercise. What's next for that patch of ground? 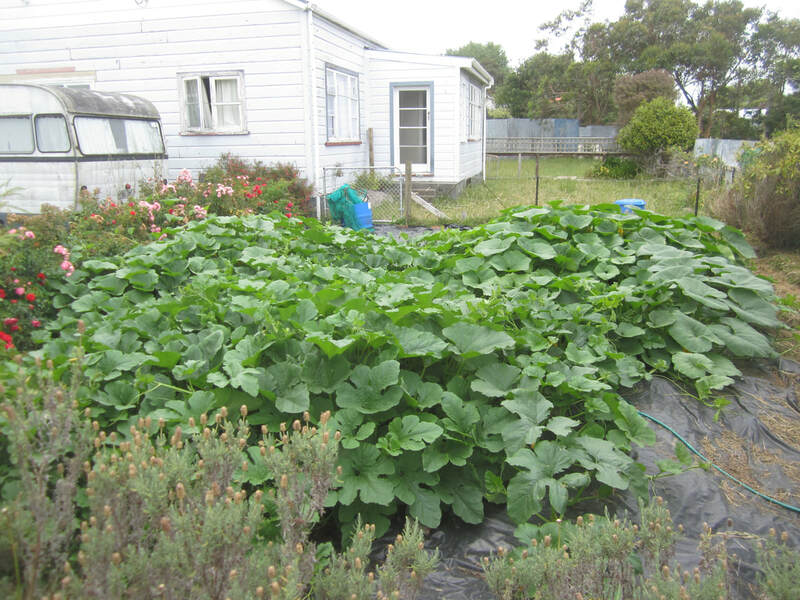 Well, I got to thinking....if I can grow 378kg of pumpkins in 50 square metres, how much total food can I grow there in a year? 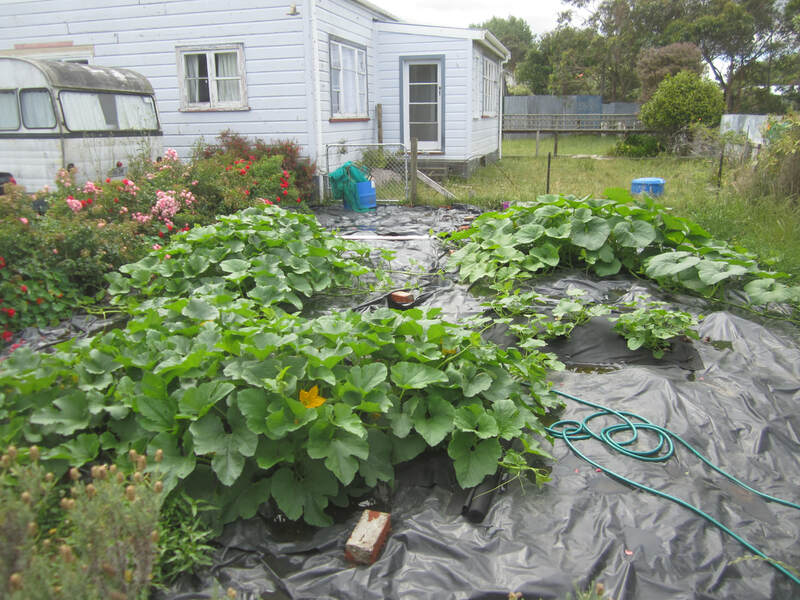 So, I'm turning over the ground bit by bit, adding compost etc, and planting winter crops, with the aim to see how much food this one patch can yield in 12 months, starting from when I planted the squash back on Dec 3rd. Updates to come! 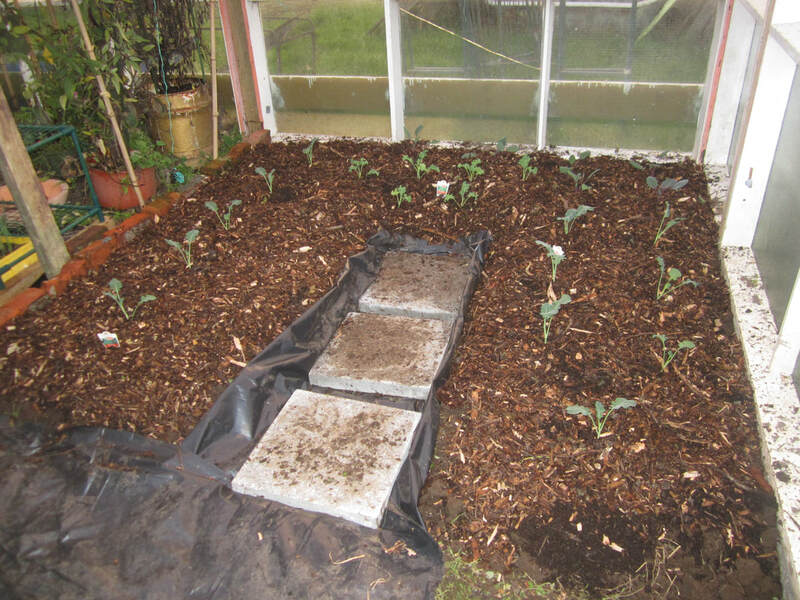 After placing the first side of my new barrier garden edge system, I needed to get cracking on preparing some plantable area for all the seedlings coming on in the greenhouse. 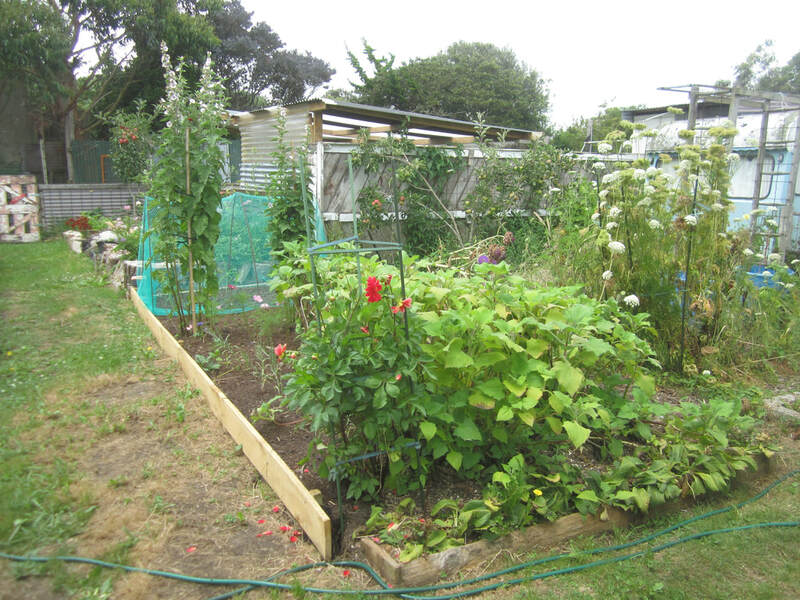 The aim: clear and dig over the area where my main garden beds were, removing weed roots etc as I go, and re-form the beds into longer east-west oriented beds and paths as I go. 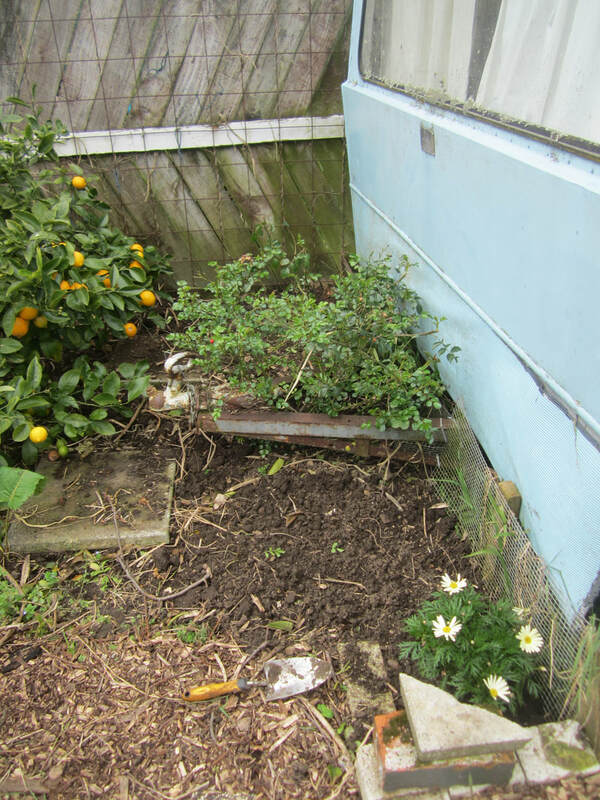 This round, I'm working over the space that was occupied by one row of four former beds, and the central path that ran between the two sets of four beds. 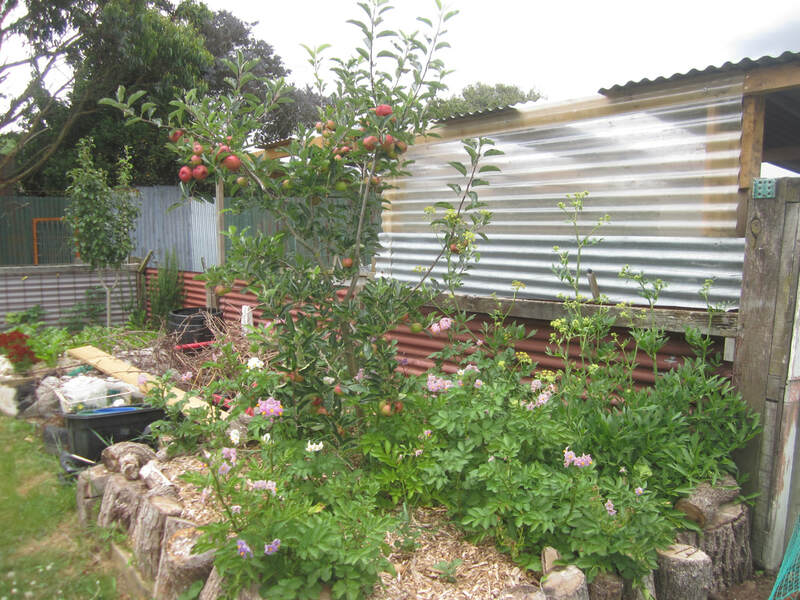 The section you see covered in newspapers was the ONLY part of the garden where I actually did what I meant to do to the whole garden area last autumn - I had piled up lots of decompostable materials under the young apple tree, then covered the areas with black plastic and left everything to rot down. 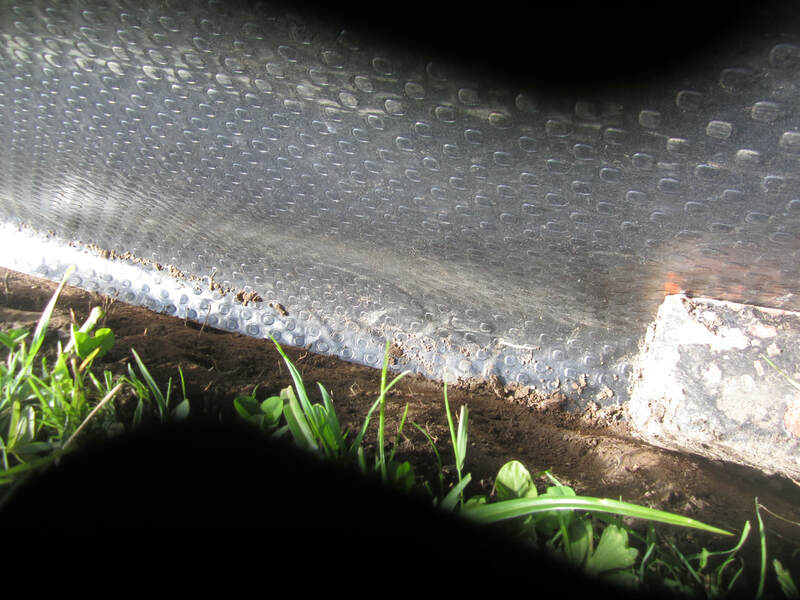 Now, I removed the plastic, lightly worked the surface to remove the couch roots that were still present (most of them directly under the plastic), and then decided to cover it in 5-6 sheets of newpaper, presoaked and overlapped, as I cannot dig this part over fully due to the roots of the apple tree. 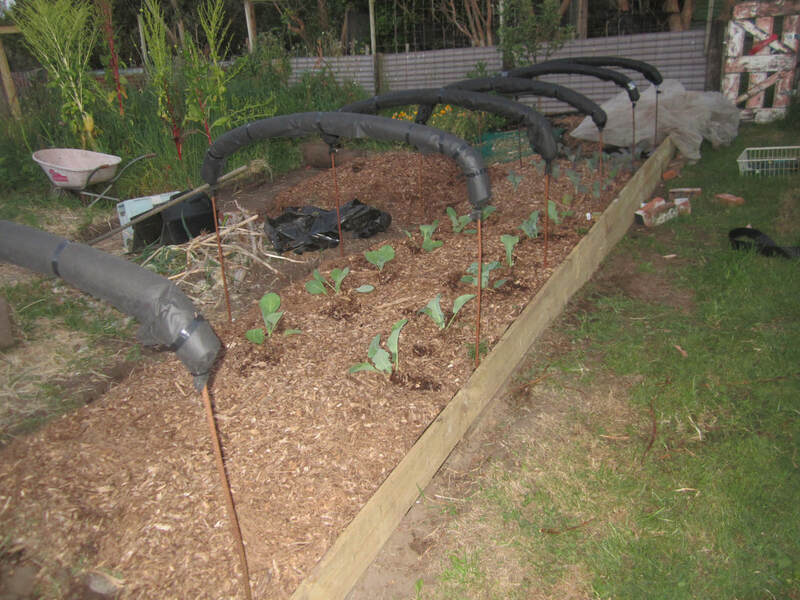 This is to prevent weeds coming back through. 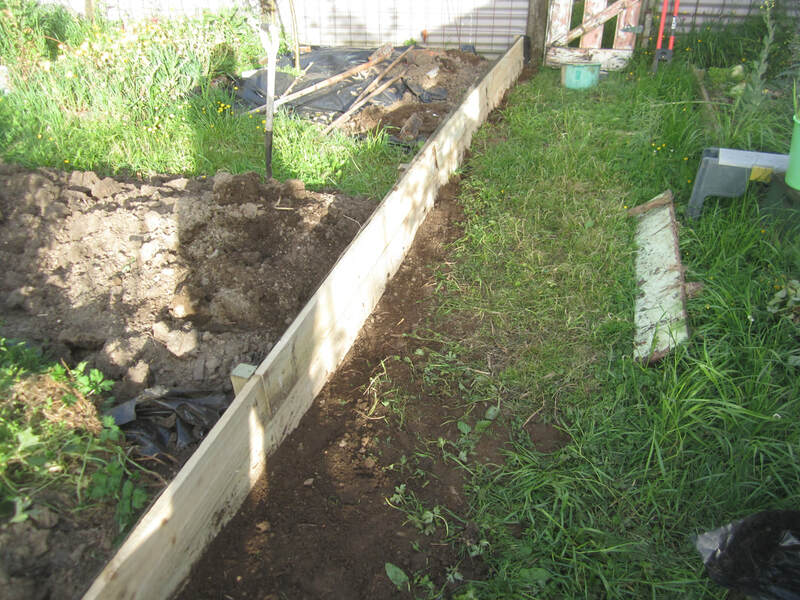 Next to that, I dug over the space that formerly had one wooden-sided bed in it, and the adjacent path area etc. This took a lot less time than I expected. 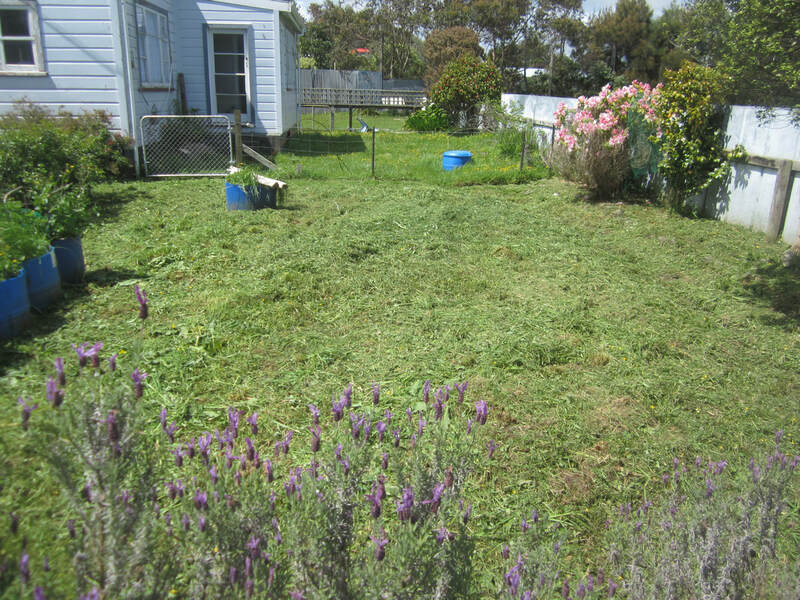 I removed every bit of couch, buttercup etc I could as I went. I think scooped out the centre of this area to create a pathway, piling the extra dirt on the adjacent parts, which are the first sections of the new soon-to-be long beds. 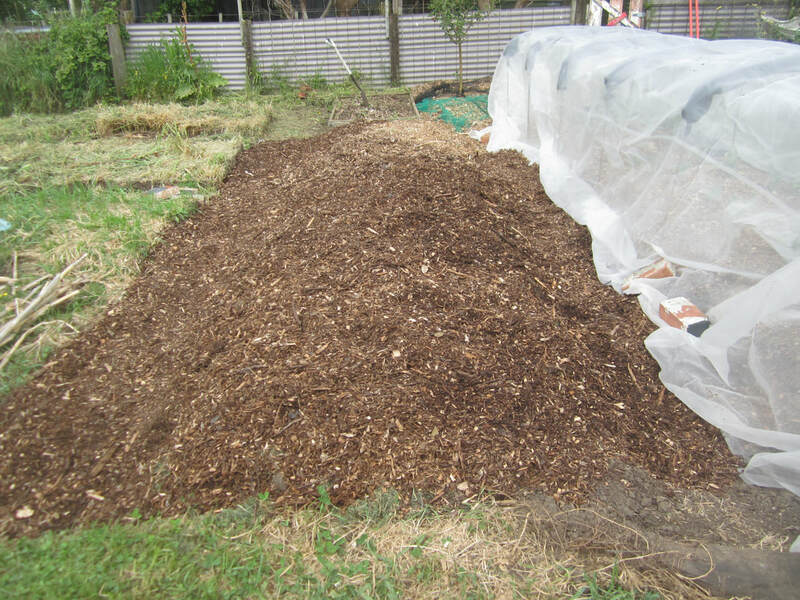 After a bit of raking and shaping, I spread a couple of inches of compost over both. 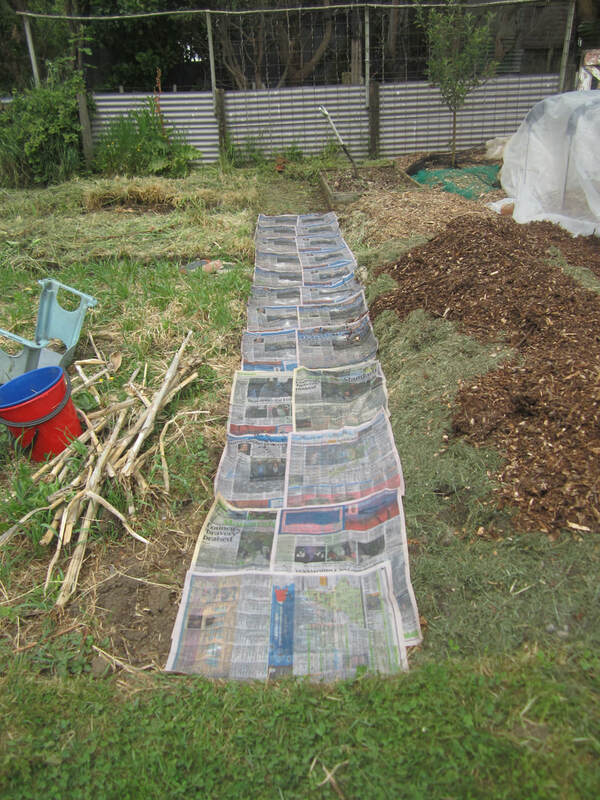 I then spread woodchip over the newspaper, and laid down bird netting on top, to discourage birds from digging in the new mulch and ripping the paper (as they are wont to do). 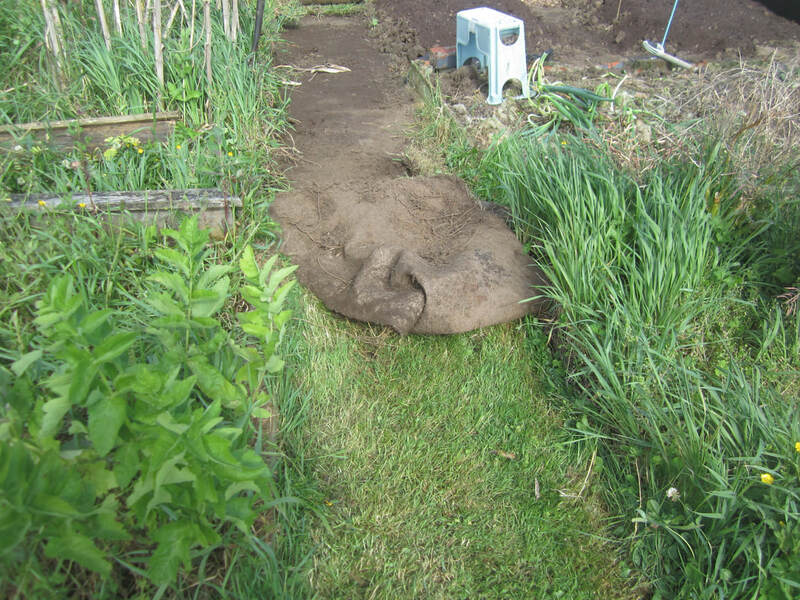 I also wanted to clear the former central pathway of grass before finishing and planting these beds, as otherwise the couch etc there would quickly creep back in. Poking around I rediscovered the fact that I had laid old carpet down this path a couple of years back - it was completely overgrown with couch. However, with the application of a bit of muscle, pulling up the carpet also pulled up nearly all the couch and buttercup, roots and all. I pulled and pulled and rolled and rolled until I had it all up. 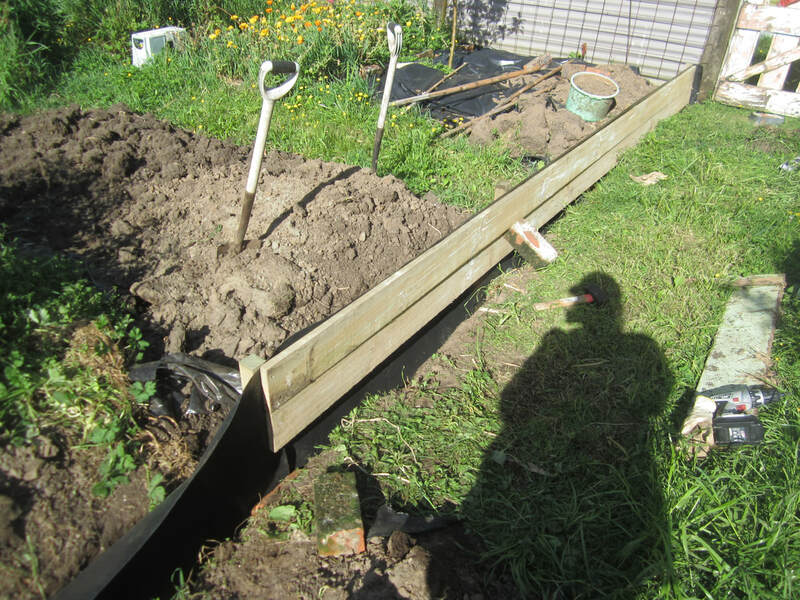 The next former-bed over had had the wooden sides removed last season, as they'd fallen to bits. 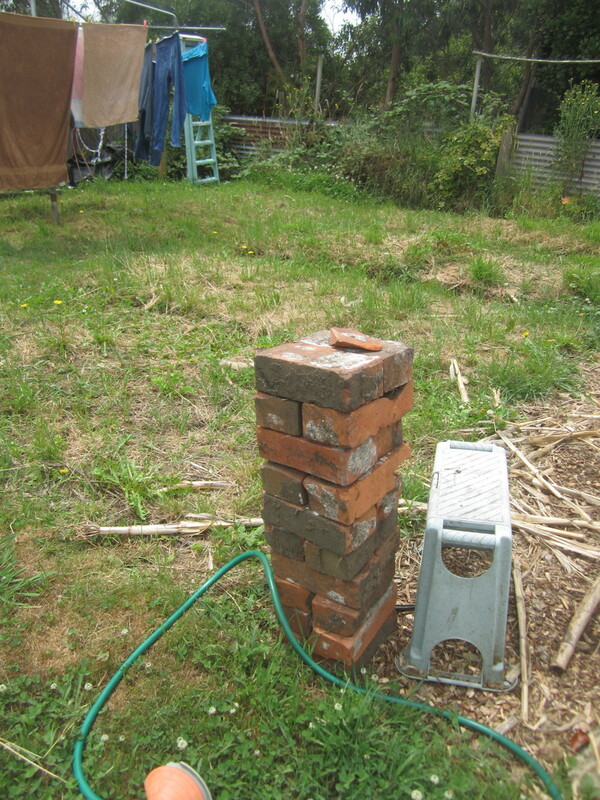 I had used old bricks to make sides in the meantime, and lined both adjacent paths with black plastic. 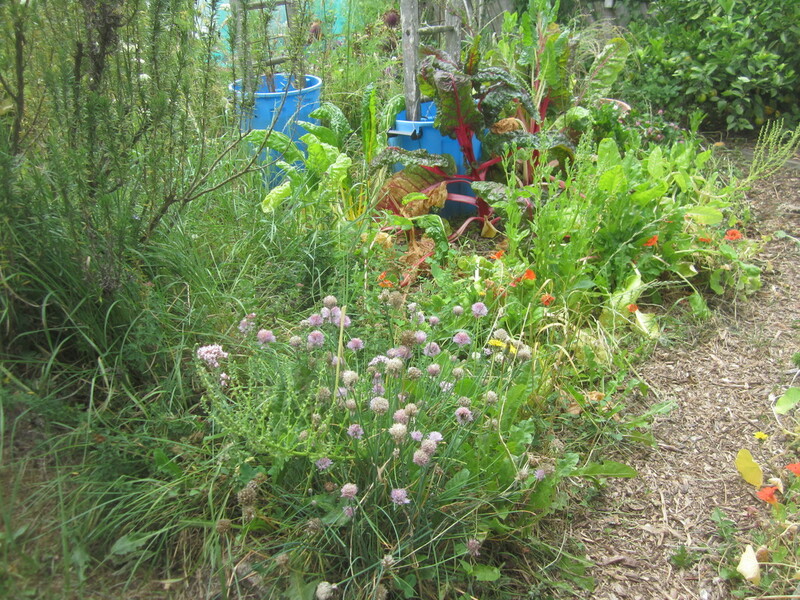 Now I removed bricks and plastic, and rough-cleared the chickweed, dock, spring onions etc from the bed. 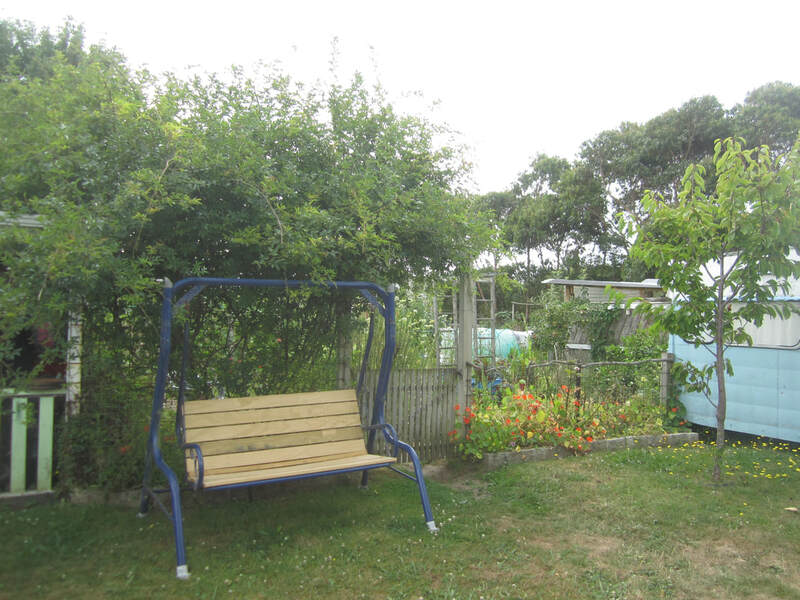 The untidyness of the rest of that half of the garden area was annoying me, so I decided to get the weedeater out and just level it. 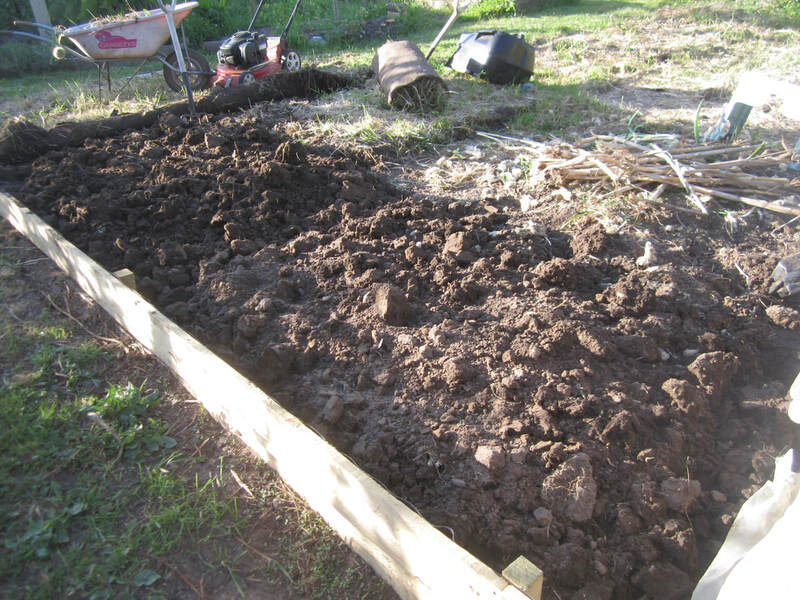 While I was at it, I removed the wooden sides from that last bed on that side, and the first two beds on the other side, and weedeatered that too. Next I went back to the first two small sections I had dug. 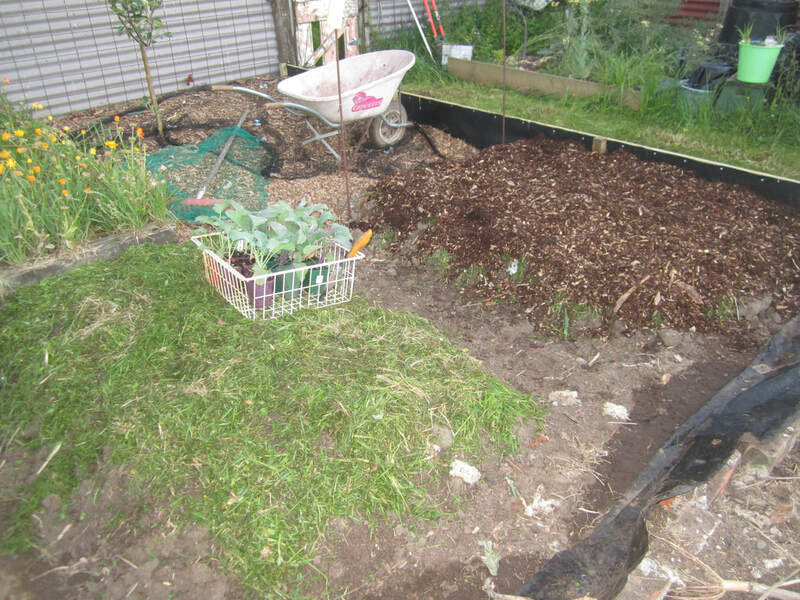 I spread grass clippings over both, then mulched the first side and pathway in the middle with woodchip. (Read why HERE). 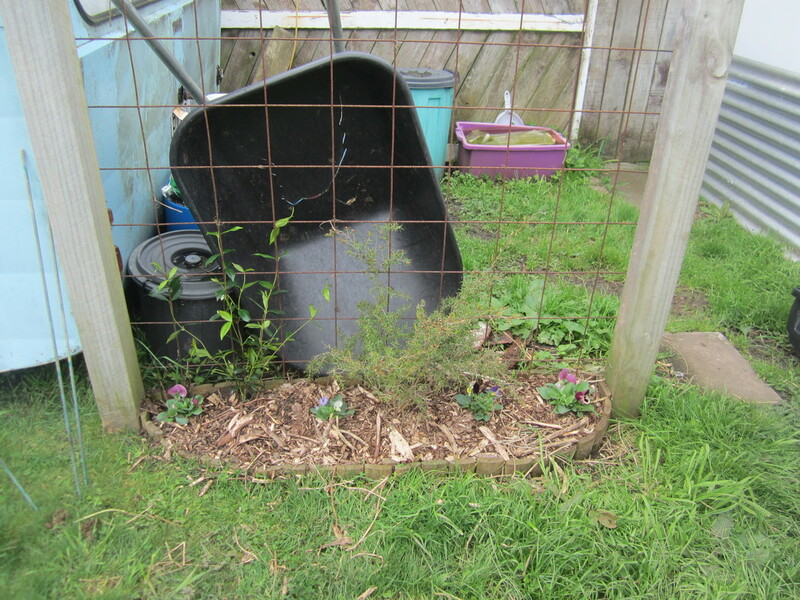 I then planted out some broccoli and purple kohl rabi in urgent need of planting into the now woodchipped patch. 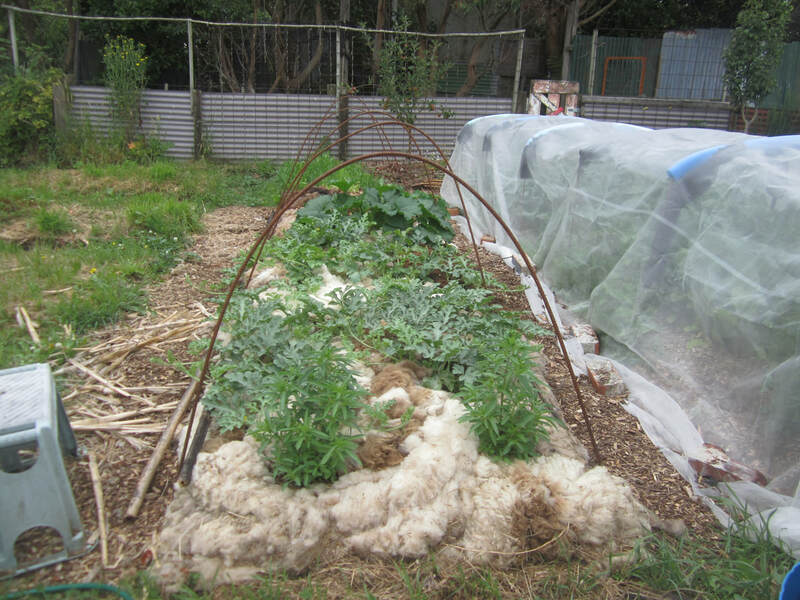 As it's time for white butterflies and diamondback moths to start being a big problem for brassicas, I added square hoops (reused) made of steel rebar, covered in pool noodles wrapped in weedmat (since I had both in the shed) to protect the mesh, and then covered them in Wondermesh, anchored with bricks for now. I also barked the second small patch. 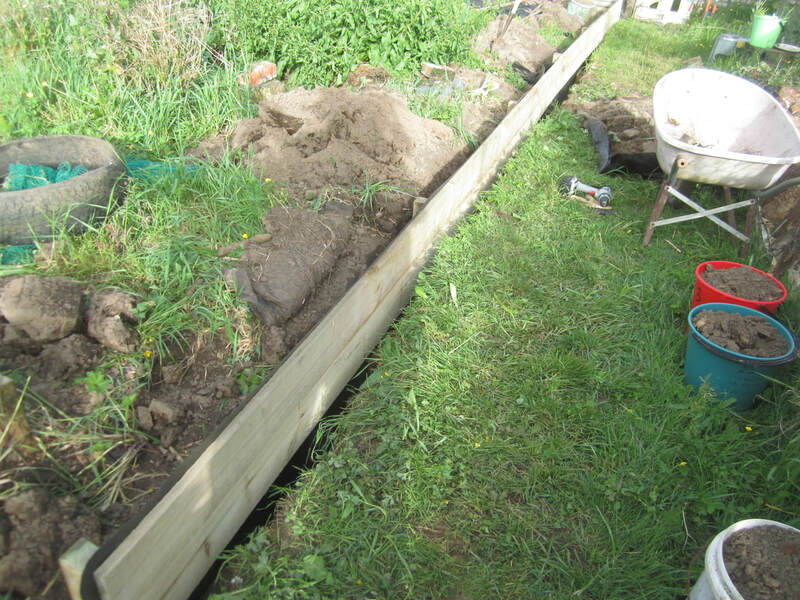 Now I continued digging over the ground along the side of my new garden barrier edge, forming what will be a long bed, just over a metre wide. 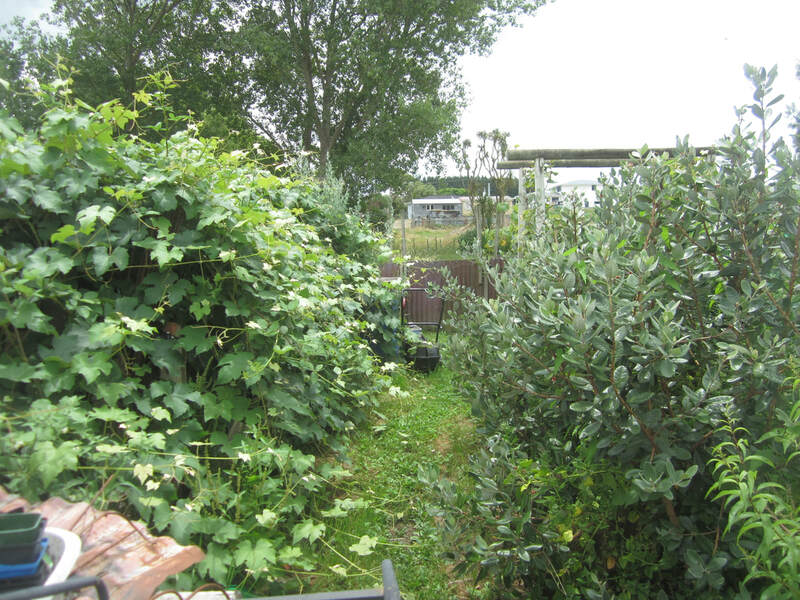 At the far end you can see the rolled back edge of the weedmat which had been put down on an area off the end of the beds, where I grew lots of container plants one year. Again, now full of couch and buttercup. 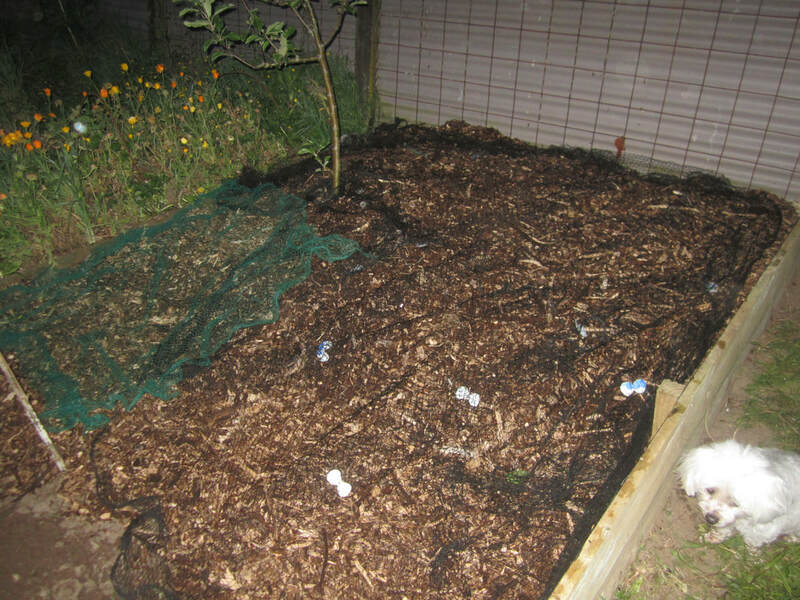 I raked it over, then covered with compost, a sprinkling of dolomite lime, then grass clippings and woodchips. 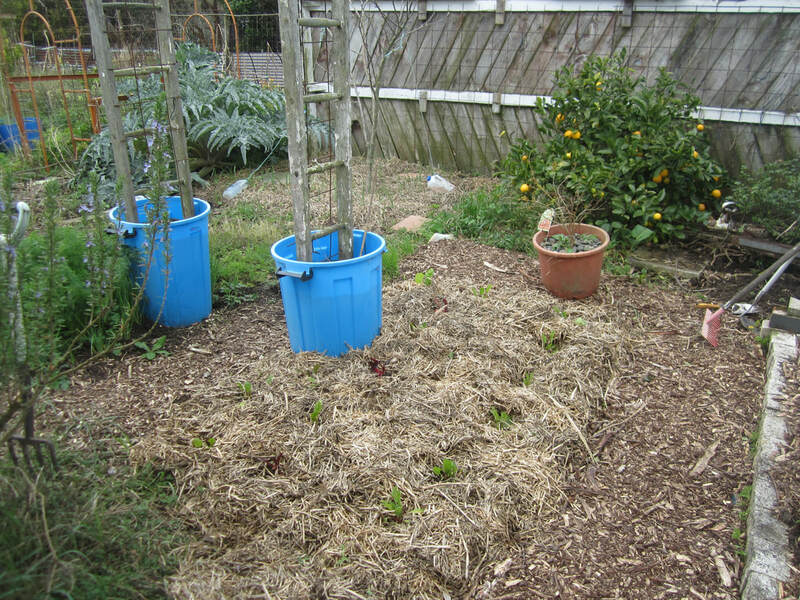 After a good watering, I planted out cabbage and cauliflower seedlings, and added more hoops. 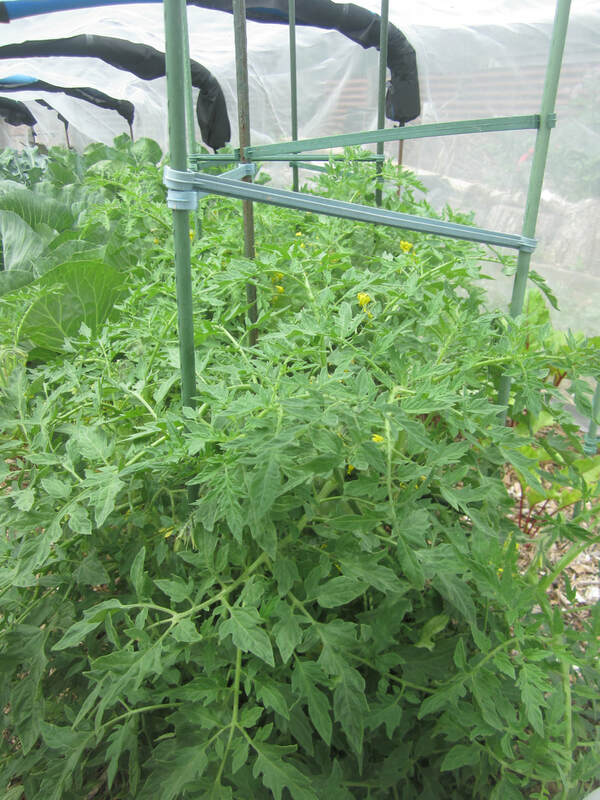 The spot at the front is left for some determinate tomato seedlings, which also need to be under the mesh to protect from tomato-potato psyllid. 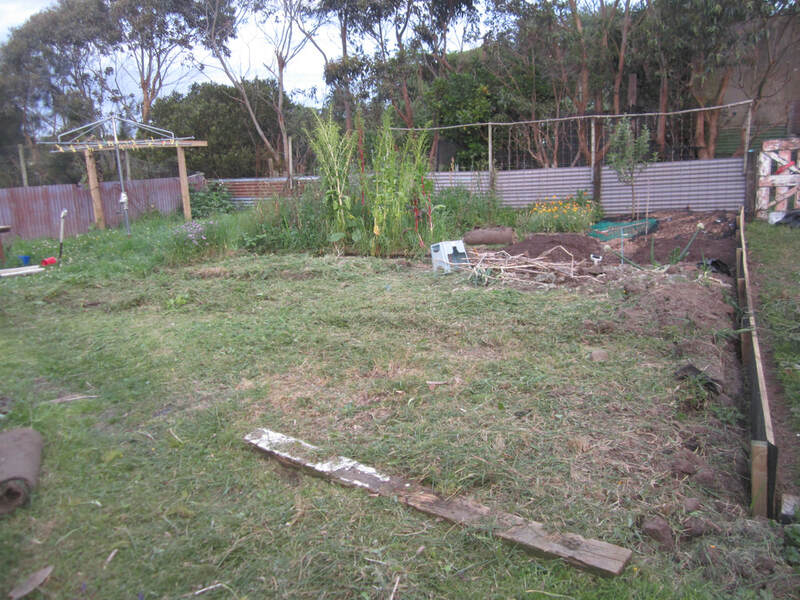 Next section dug over, raked, added compost, dolomite and grass clippings. Before woodchipping this, I wanted to lay down paper in the pathway. 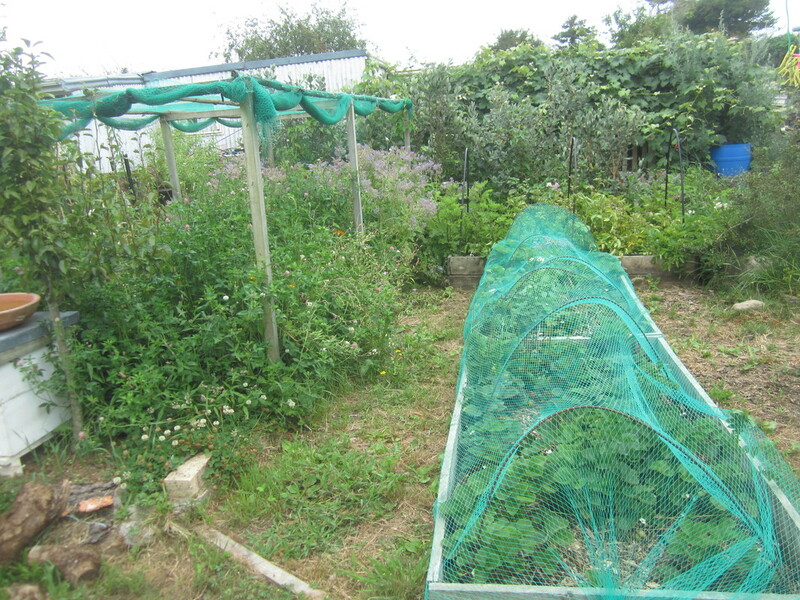 I've since planted 3x Russian Silvery Fir tomatoes under the mesh, with tomato cages around them, a clump of Miner's Lettuce, and interplanted the brassicas with a tray of beetroot seedlings. 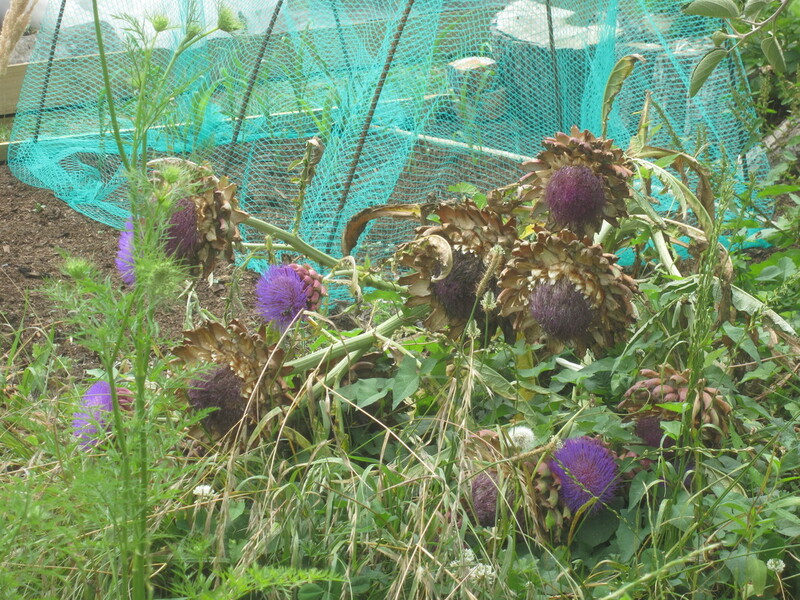 And later added four more kohl rabi seedlings which were started later (for staggered harvesting). 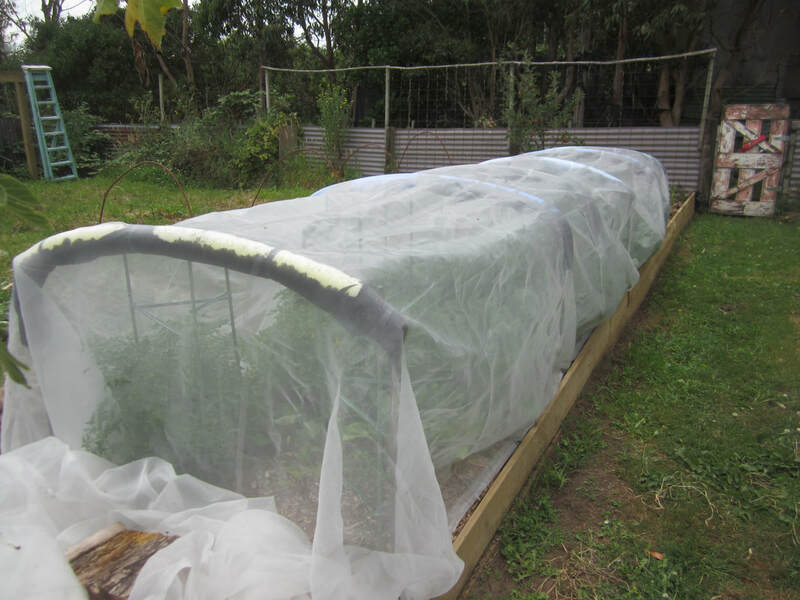 The covered bed is now full. 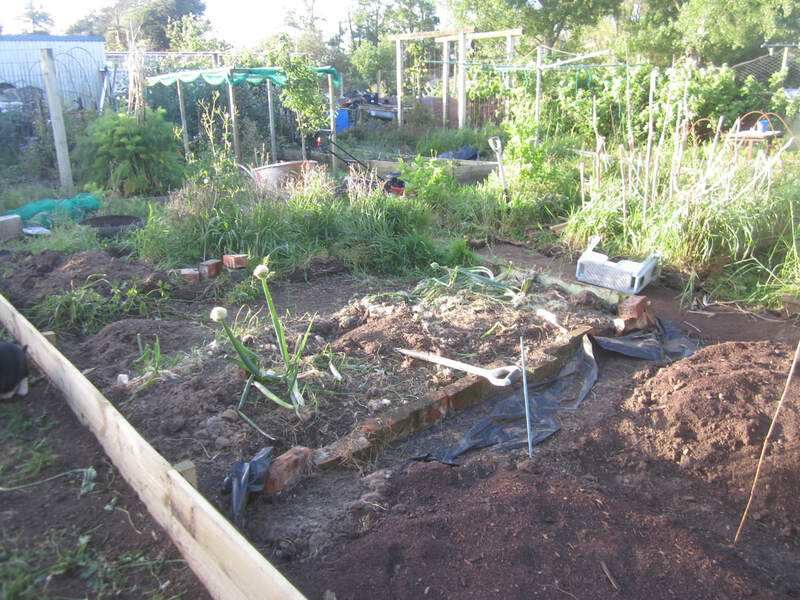 At this point I still needed to remove the wooden frame from and dig over one small garden patch at the far end (where the fork is stuck in the ground), but my ribs have prevented me doing so. Today I'm finally feeling mostly pain-free, so it will be on the agenda soon! 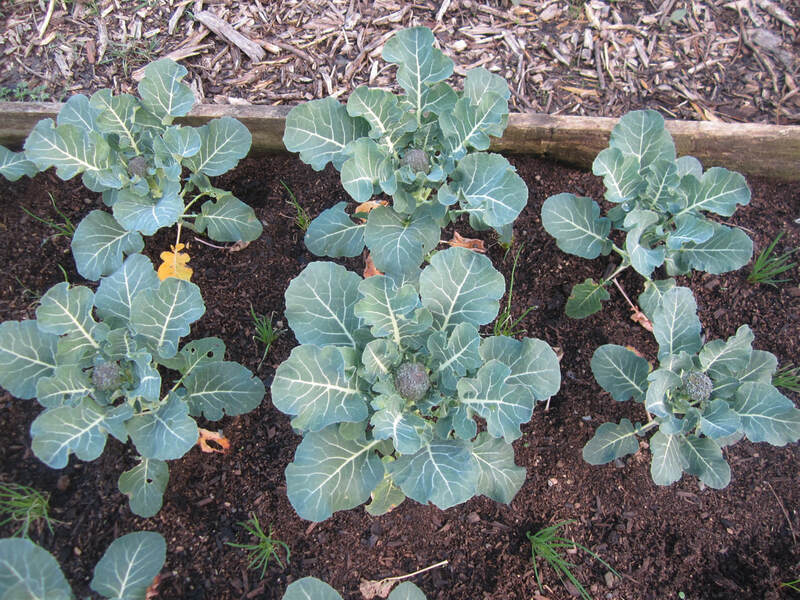 Brassicas (including broccoli, cauliflower, cabbage, kale, radishes and much more) are winter favourites in many gardens, especially as their major pests - white butterfly and diamondback moths - are absent during that time. 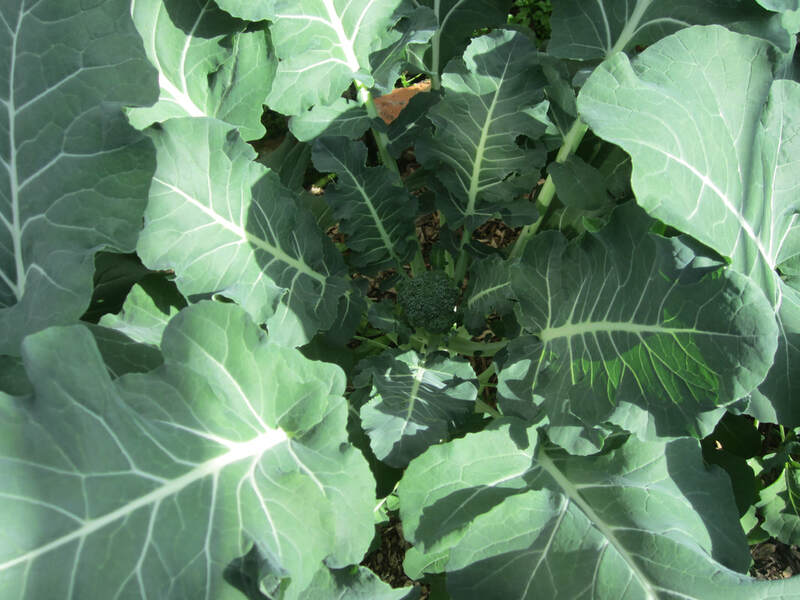 However, to get good winter production from brassicas, the timing of planting is key, especially in colder areas. 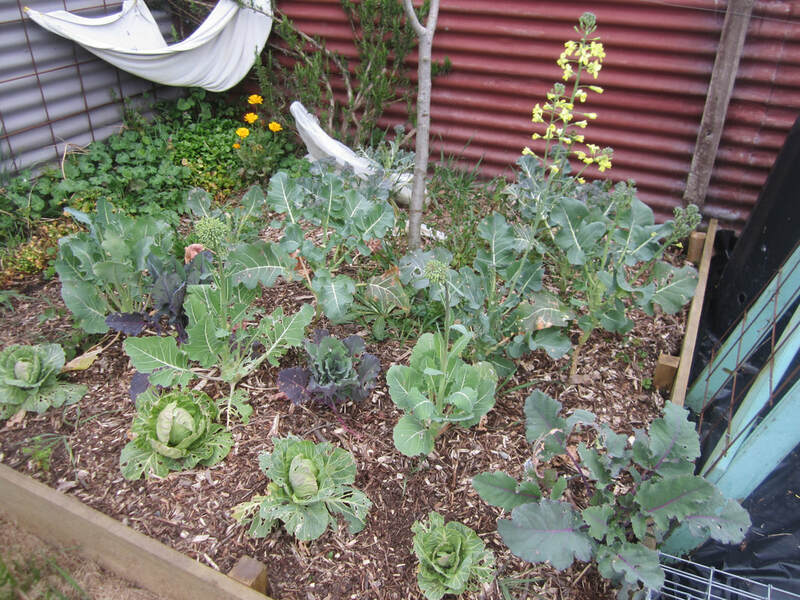 Where I live, in the lower North Island, I have found that the ideal time to plant out most brassicas (except brussel sprouts, which need longer) for winter production is March. 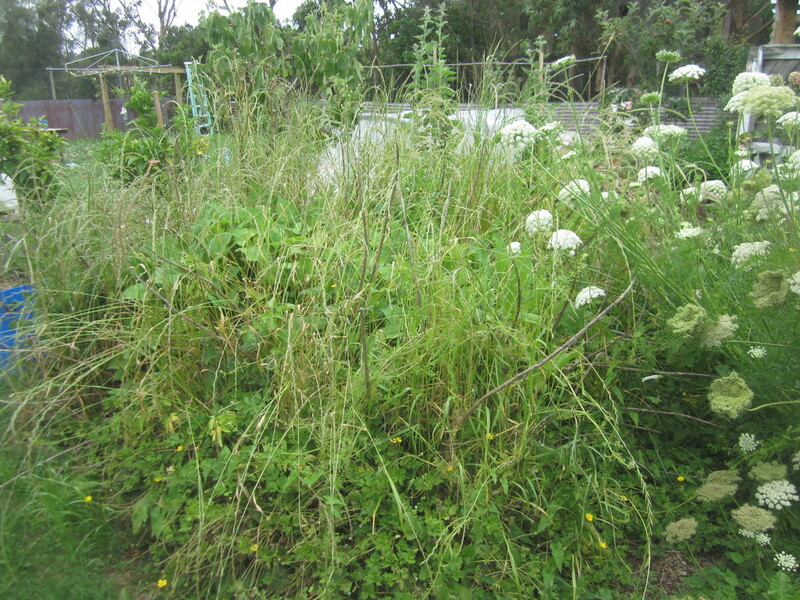 If I leave it later, the temperatures become low, and the plants go into a state of semi-dormancy (this happens below 10C), with growth slowed right down, and the size of the productive heads being much smaller, if produced at all - sometimes the plants remain very small and unproductive, and then bolt straight to small flower heads in spring when it warms again. This will depend on timing of planting and just how cold the winter is. 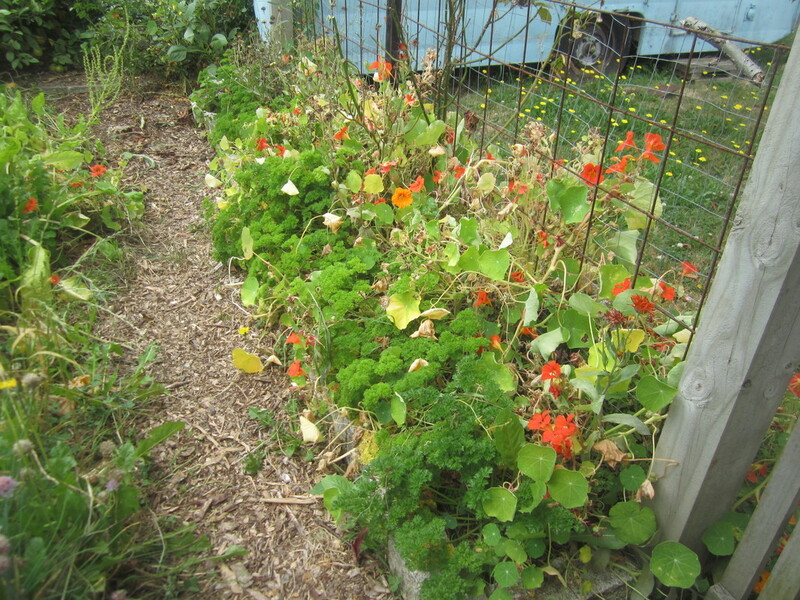 On the other hand, when planting in March, I still need to protect them from white butterflies. 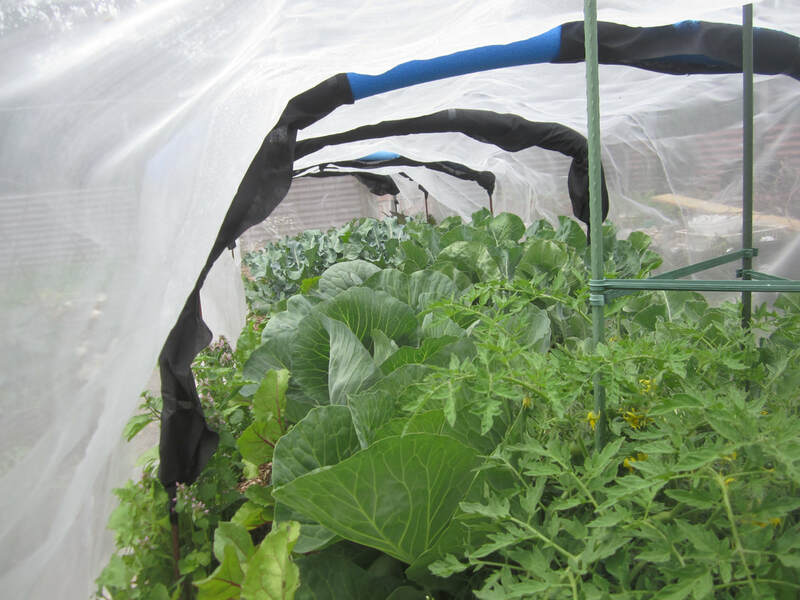 One year I did this using micromesh, which is used to against psyllids and other pests. 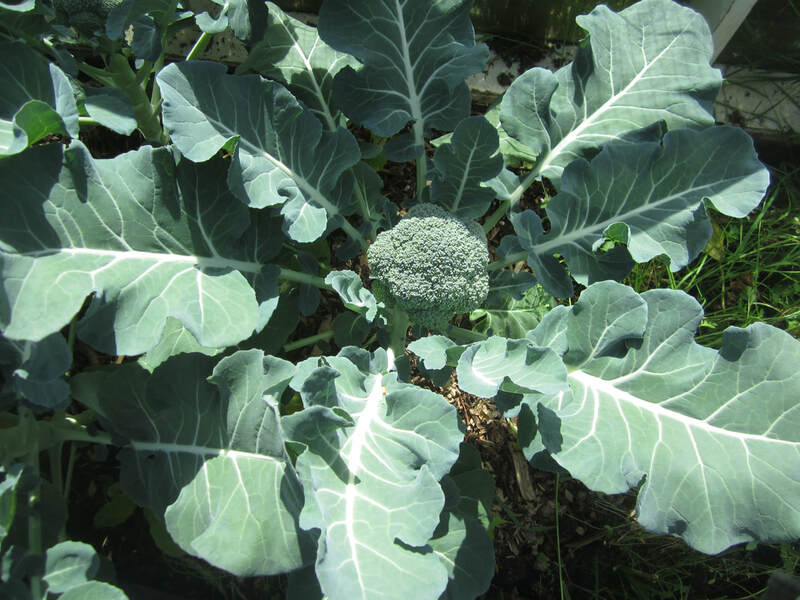 It also had the effect of producing a micro-climate of warmer are in the completely covered bed, and those broccoli were HUGE and fully ready for picking by early June - sooner than I had counted on. 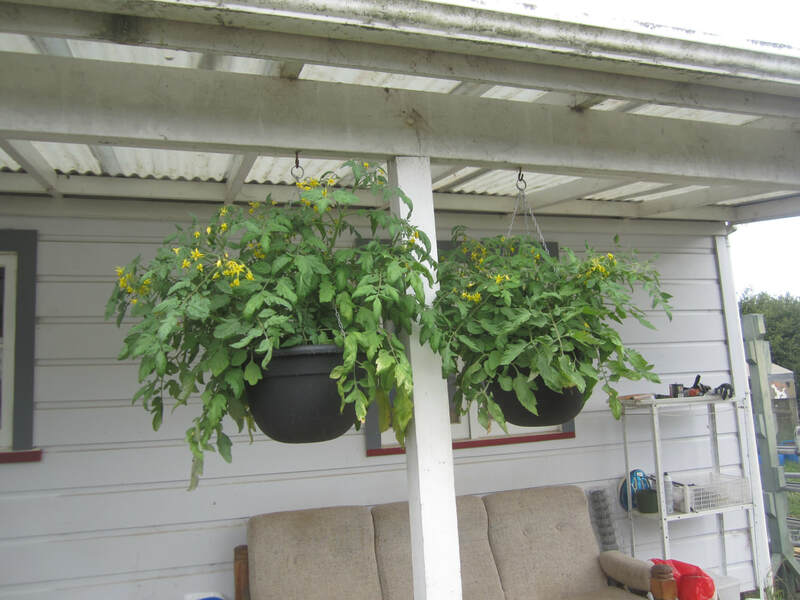 I see a similar result if I plant them earlier than March too - still warm temps cause faster maturation. 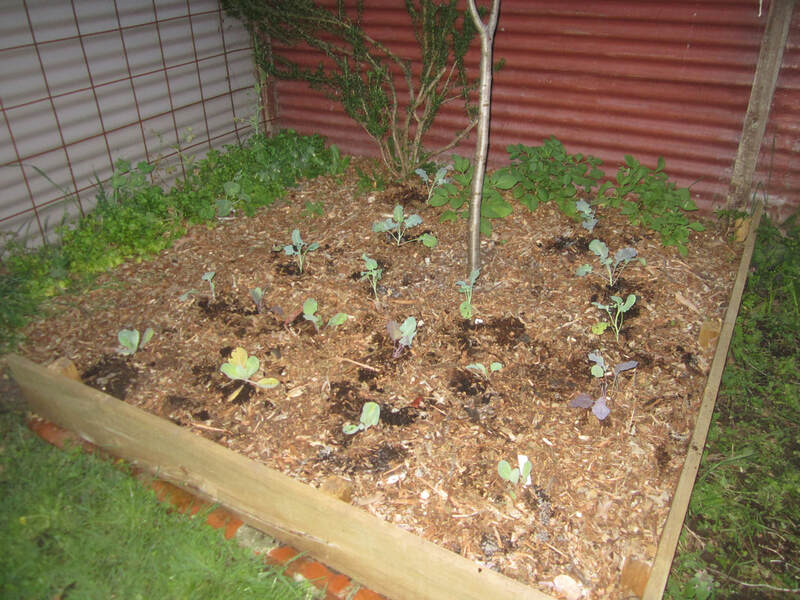 Broccoli, cabbage and kohl rabi, planted 28th April in a 6 inch high raised bed. 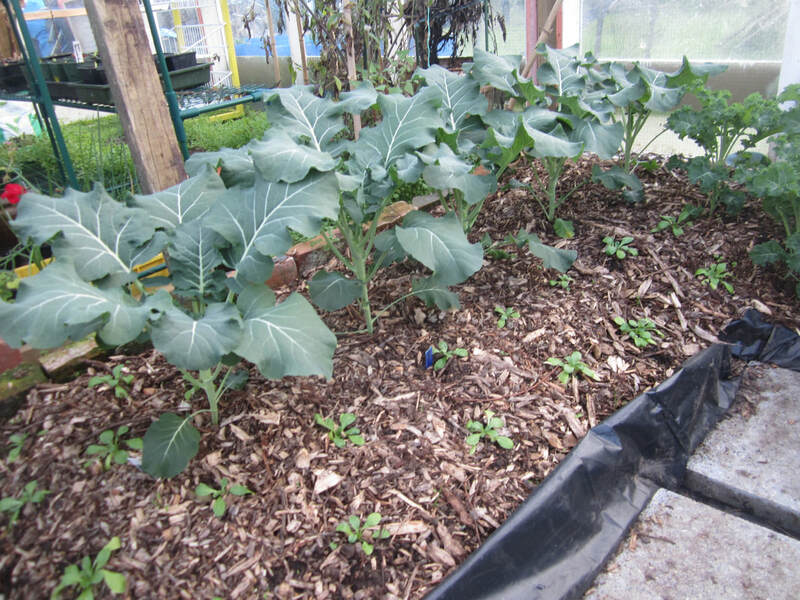 Broccoli, cabbage, kohl rabi, planted 4th May in 12 inch raised beds. 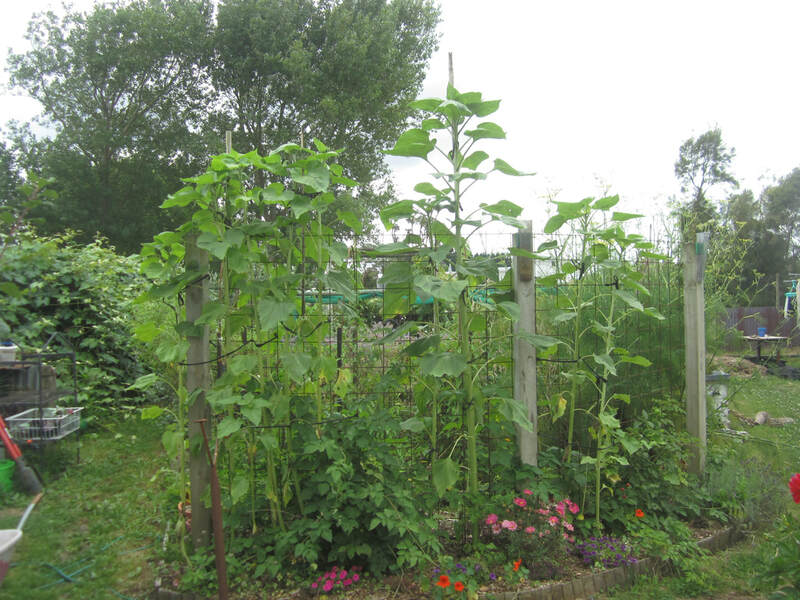 This extra height, and sunny, sheltered position may give them some advantage over group 1. 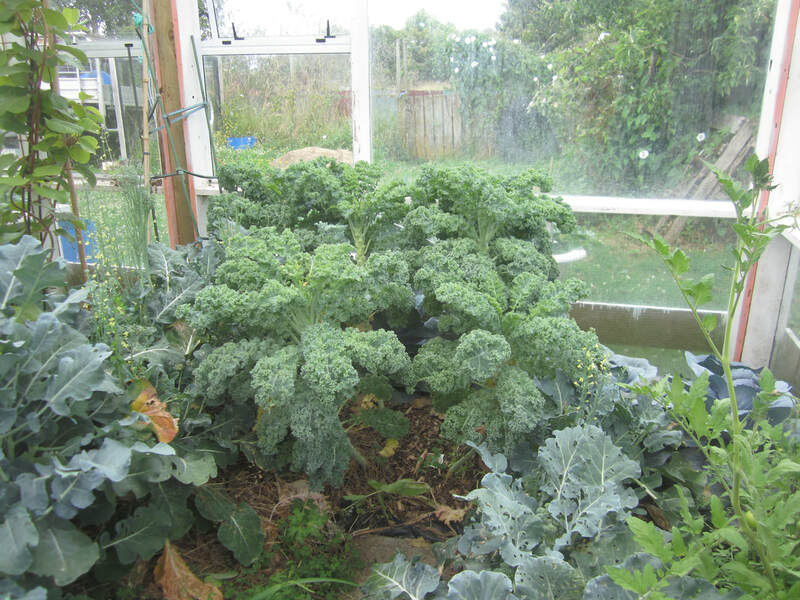 Broccoli, red cabbage and kale, planted in greenhouse on 5th June. 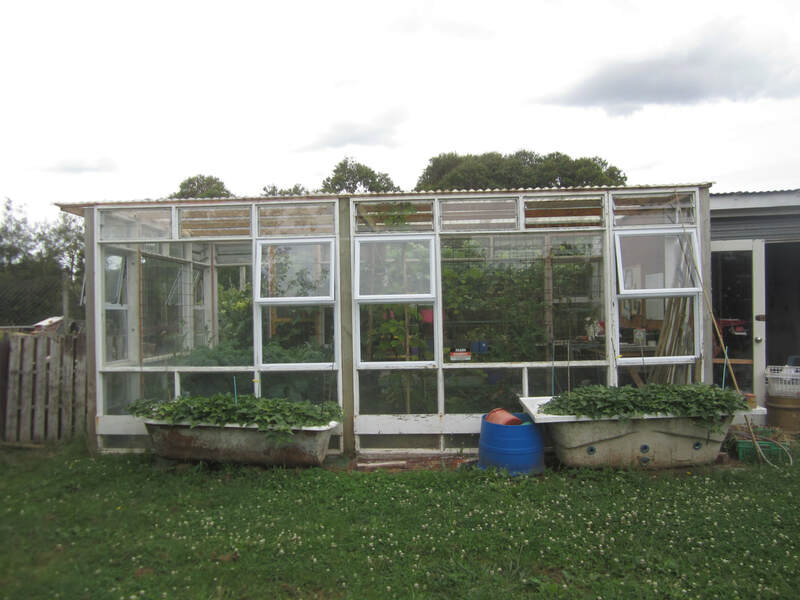 The greenhouse is made of recycled glass windows. 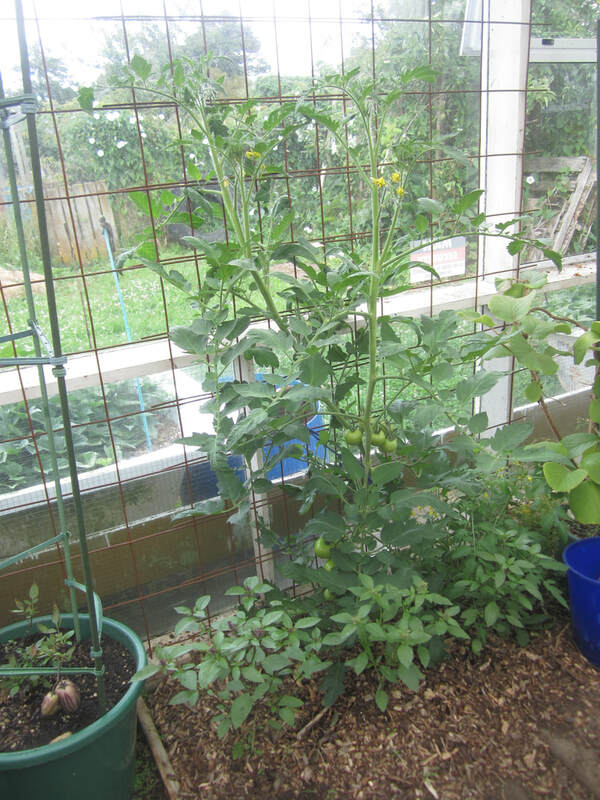 I leave some windows open pretty much year round, though did close them on the coldest nights in the first month of growing these seedlings. 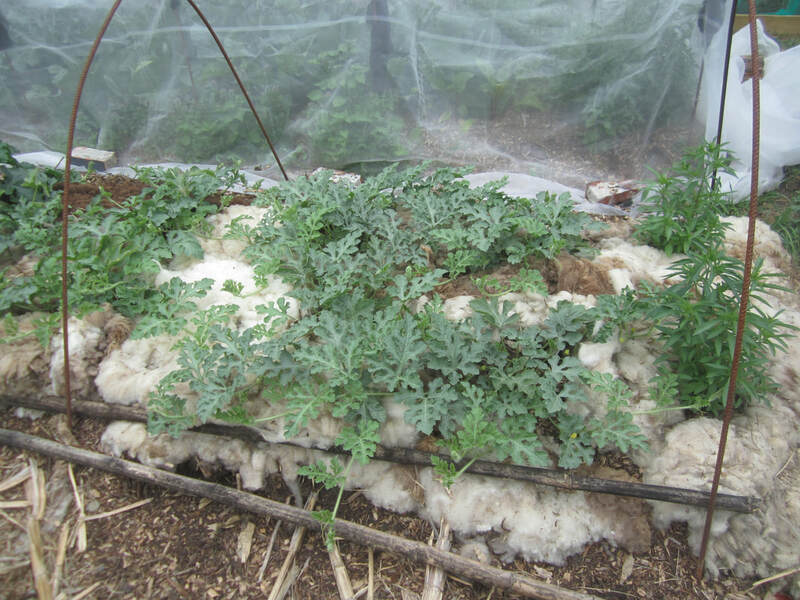 While the greenhouse does get cold at night, it's structure provides protection from all but the severest frosts, and it is very warm in there during the day. 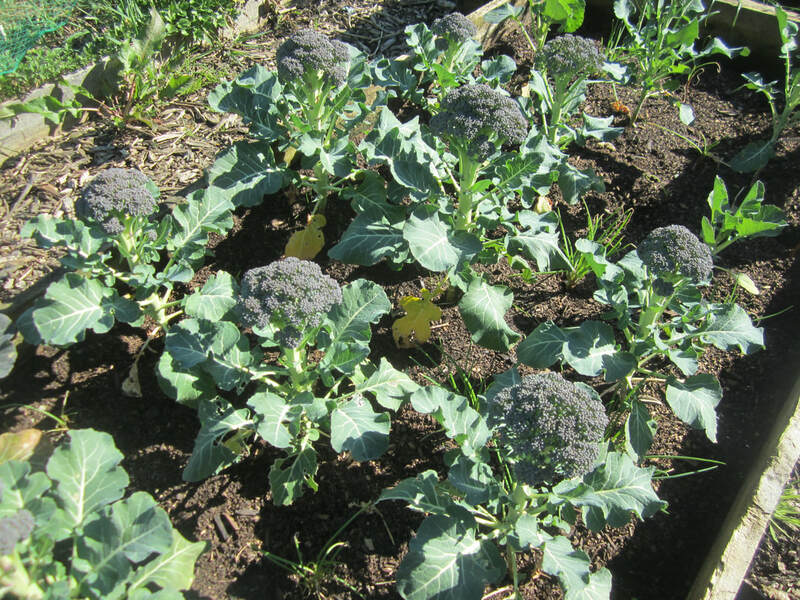 Group 1: Some moderate growth - some nice but small heads forming on the broccoli. I went ahead and picked them, as some were bolting straight to flowers, and it was obvious the others weren't going to get much bigger. 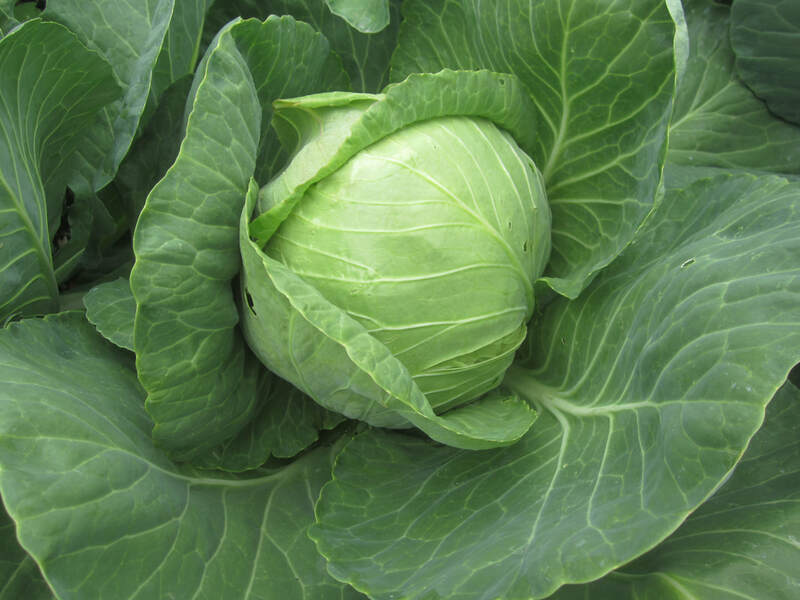 Cabbage very small, kohl rabi look ok-ish, but no sign of any decent bulbing. 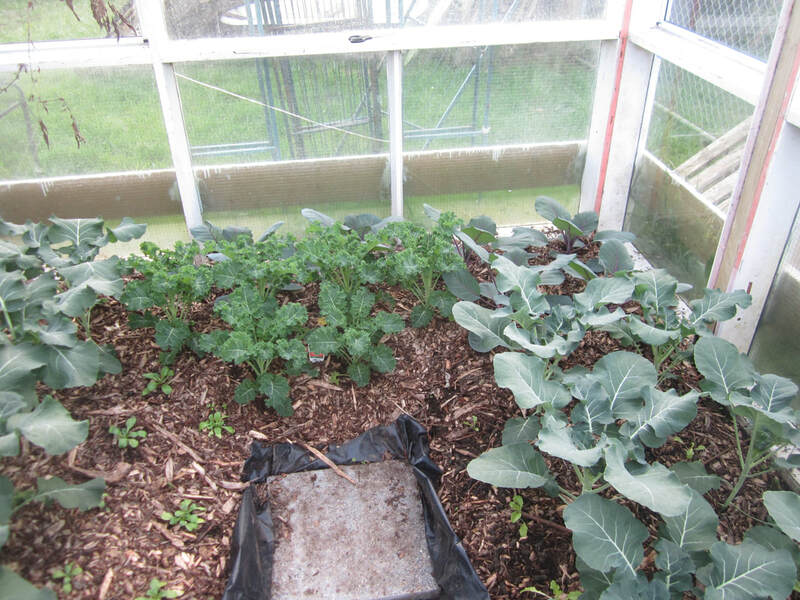 Group 2: Growth in cabbages and kohl rabi very minimal. 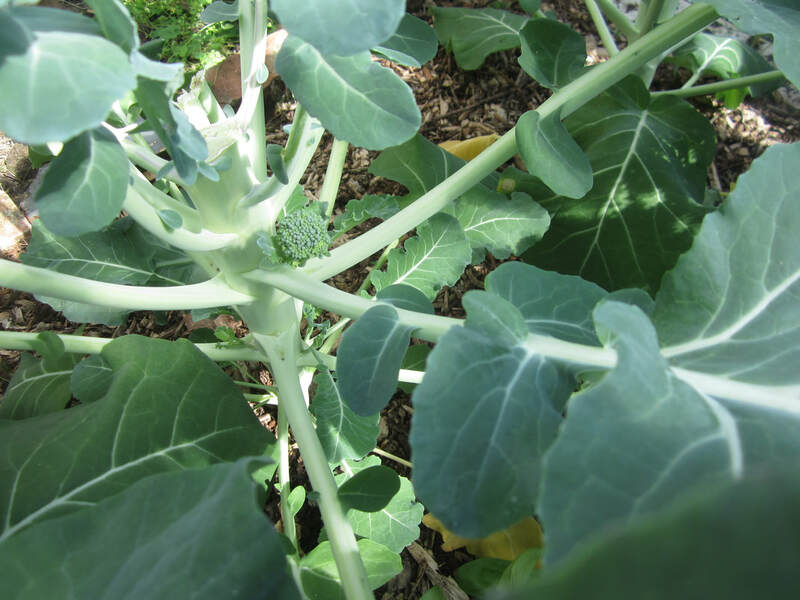 Broccoli have gained some size, and are forming very small heads. 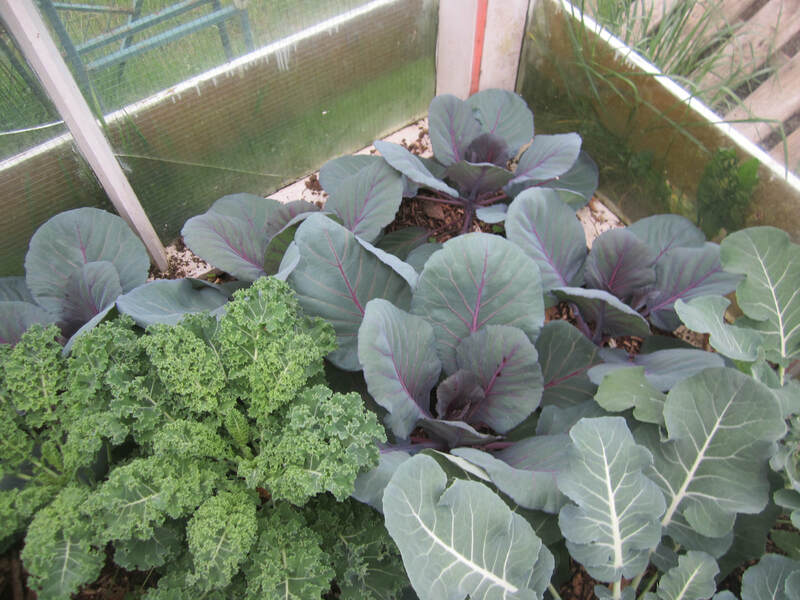 Group 3: excellent growth in broccoli, kale and red cabbages in the greenhouse. No sign of heads forming yet, which is good. I have two varieties of broccoli in here - a larger variety on one side, and a smaller one on the other. 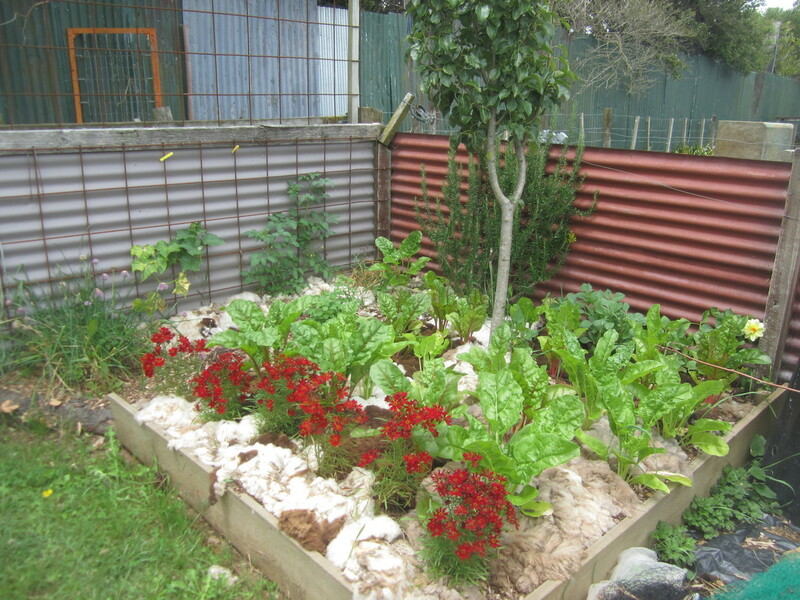 Red cabbages are hidden behind the kale in the 2nd pic. 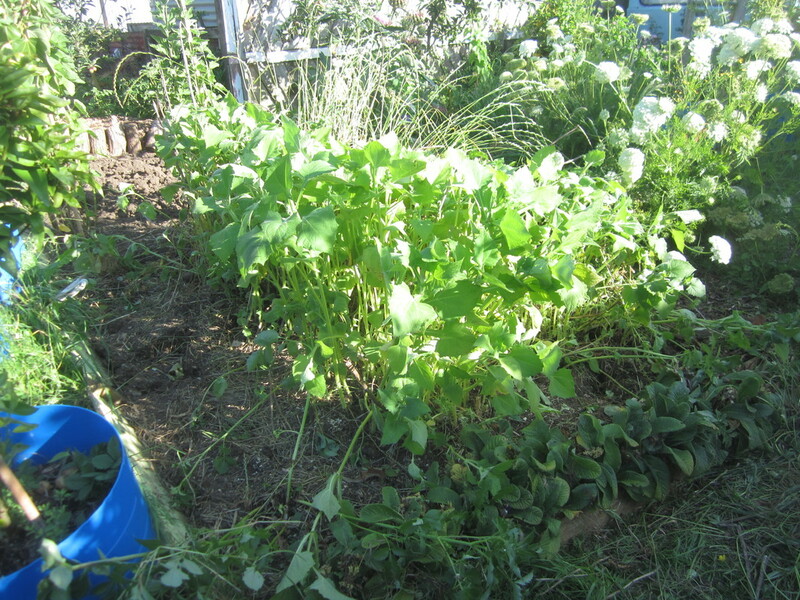 Brocc underplanted with cornsalad/mache. Group 1: These are looking pretty pathetic. 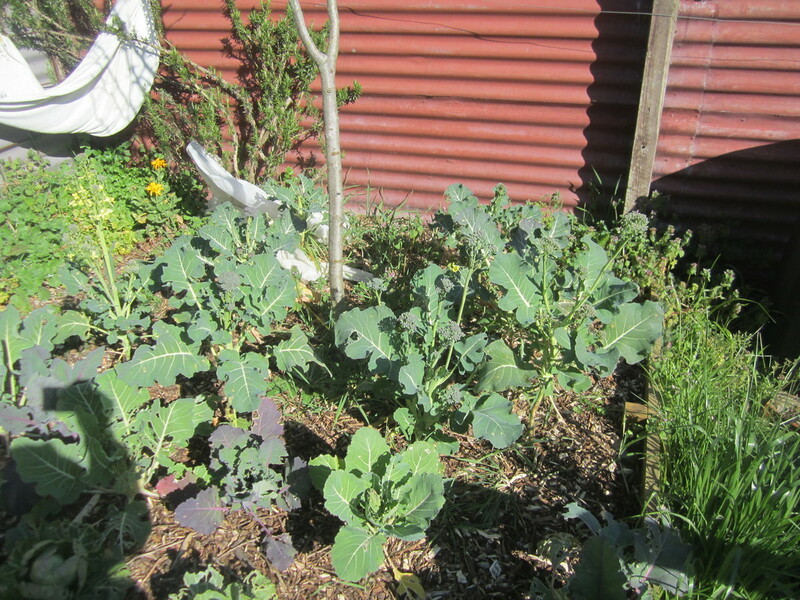 I'm picking small shoots and heads of broccoli as they turn up. 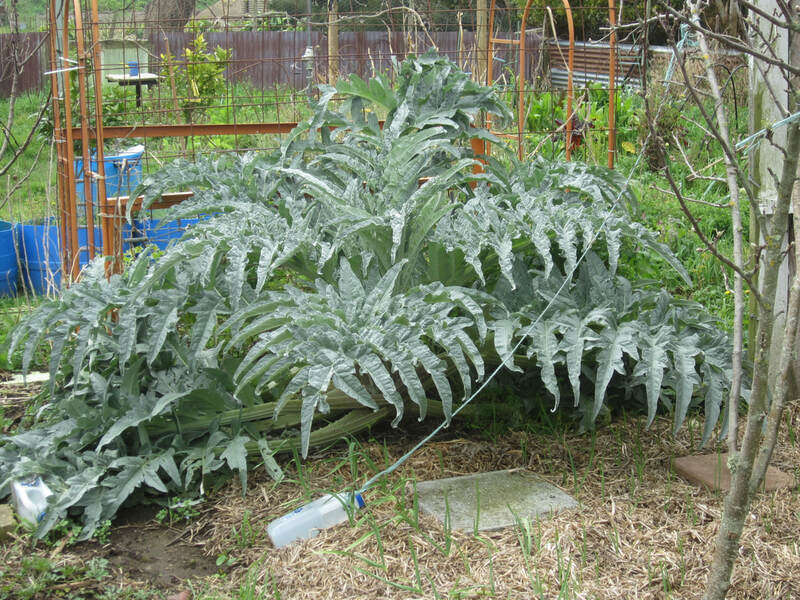 The other brassicas are pretty much a waste of space. Group 2: Picked main heads on most of the broccoli. Reasonable size, especially for size of plants, but not very large. Certainly edible. Not holding out much hope for the cabbages and kohl rabi. Some of the brocc plants are still very, very small. 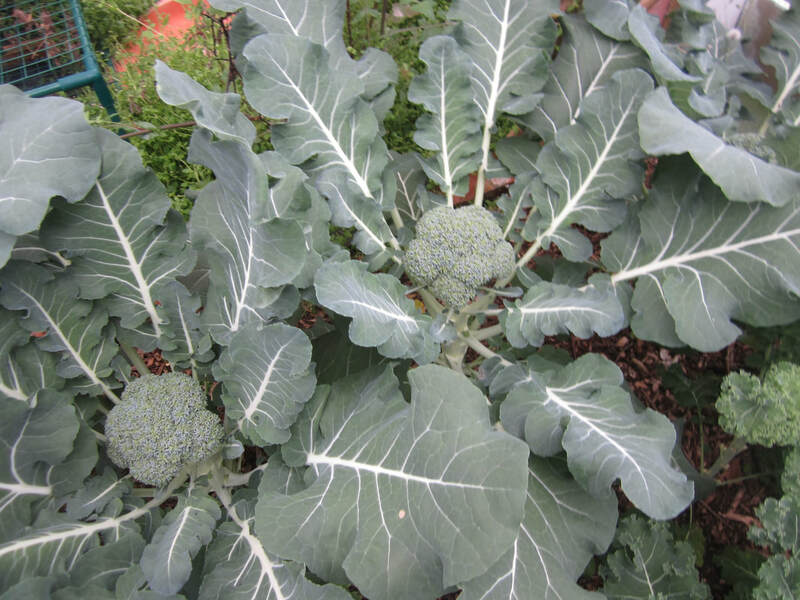 Just starting to see the formation of heads in the midst of the biggest broccoli variety. 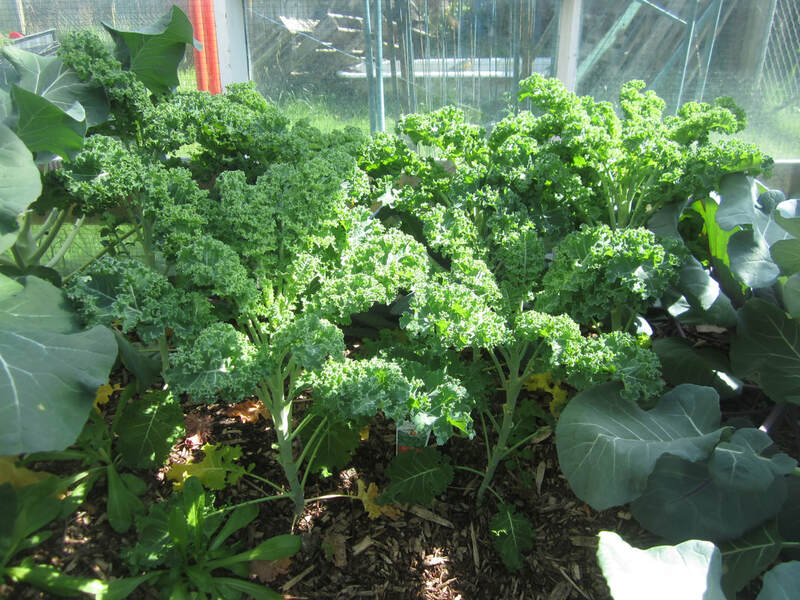 Have been picking kale every day for smoothies for a while now. 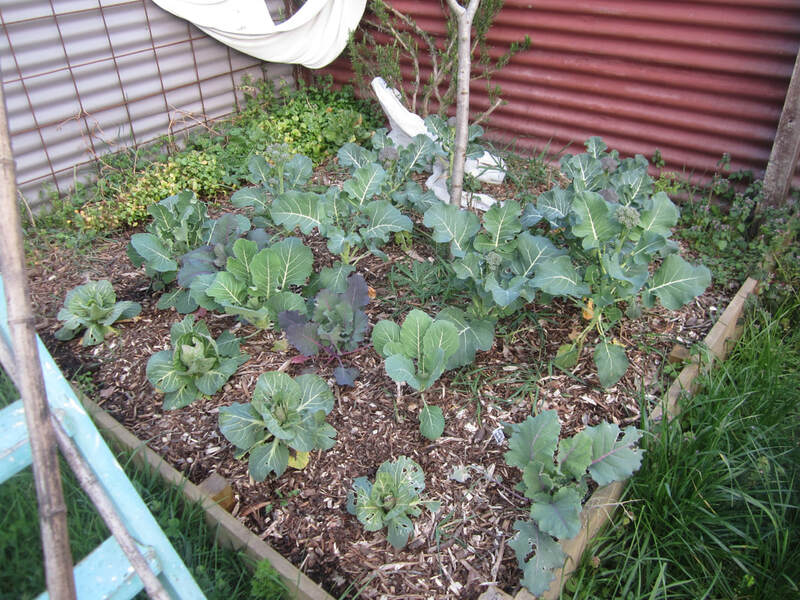 Cabbages looking good too. Pretty much given up on Group 1 - taking a few brocc shoots. 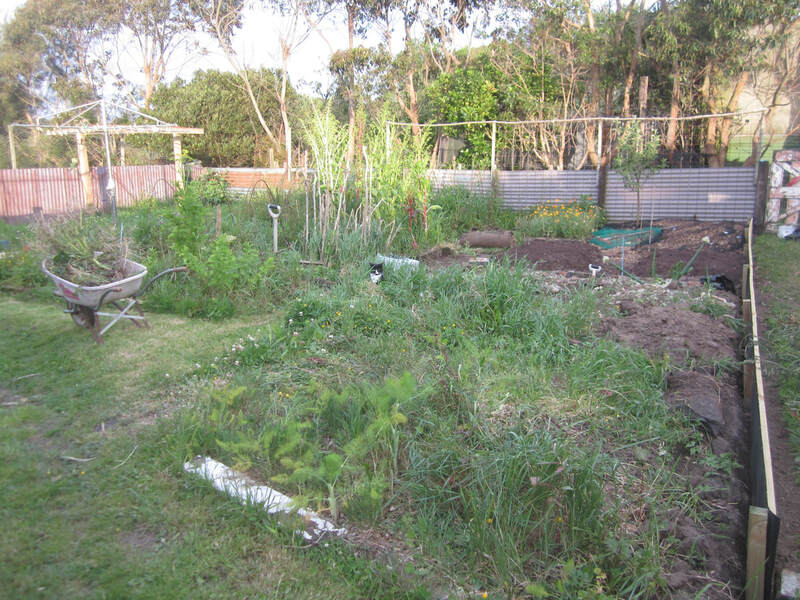 They're now mostly just sitting there until I get around to clearing the bed and planting something else. Group 2: picking fairly steady amounts of side shoots from these broccoli. 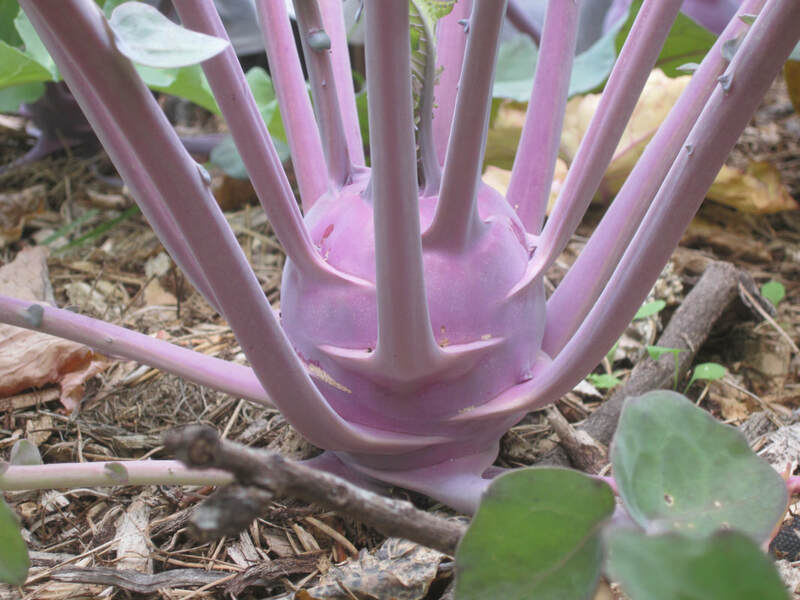 The purpling of the leaves is a sign of how the cold has affected these plants, stunting their growth. Group 3: Lovely heads forming on the larger plants! 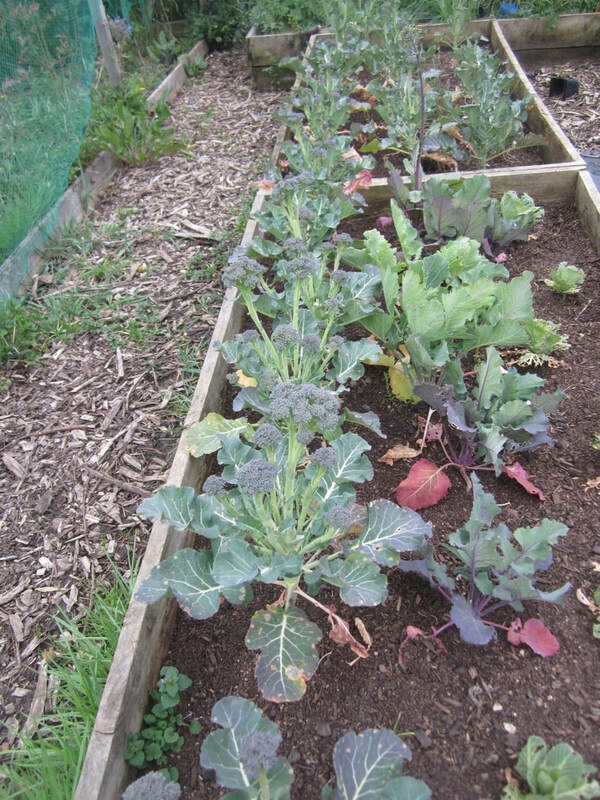 14th September: I picked the last small shoots on Group 2 broccoli, and ate them raw in the garden (yum! 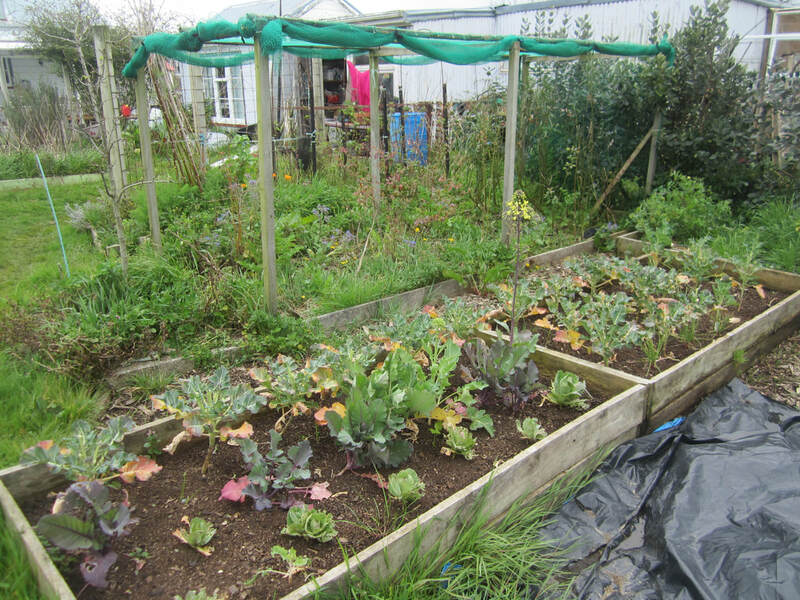 ), then picked the leaves off the kohl rabi, nicer leaves of brocc and cabbage, and used them lightly steamed for dinner, before ripping out all these plants and replacing them with strawberries. 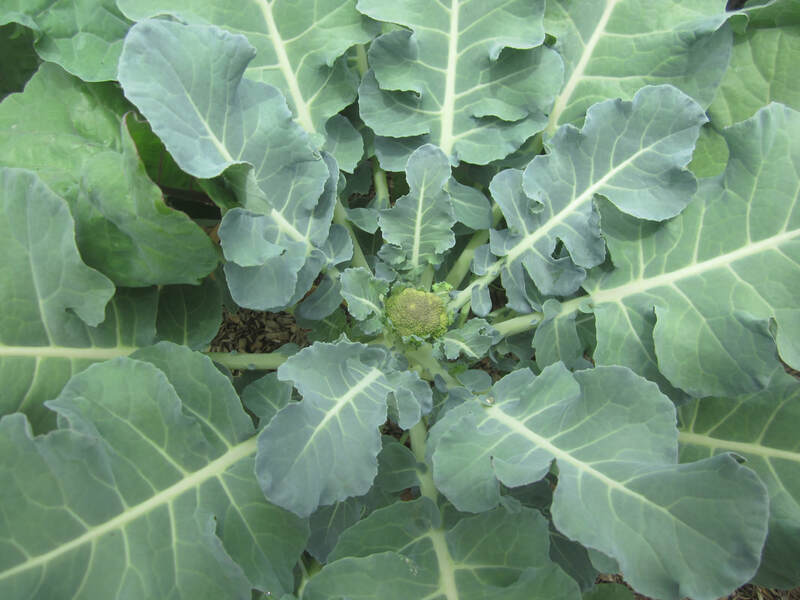 Today (17th September), Group 3: There are nice heads on the second variety of broccoli, as well as small side shoots forming on both varieties. 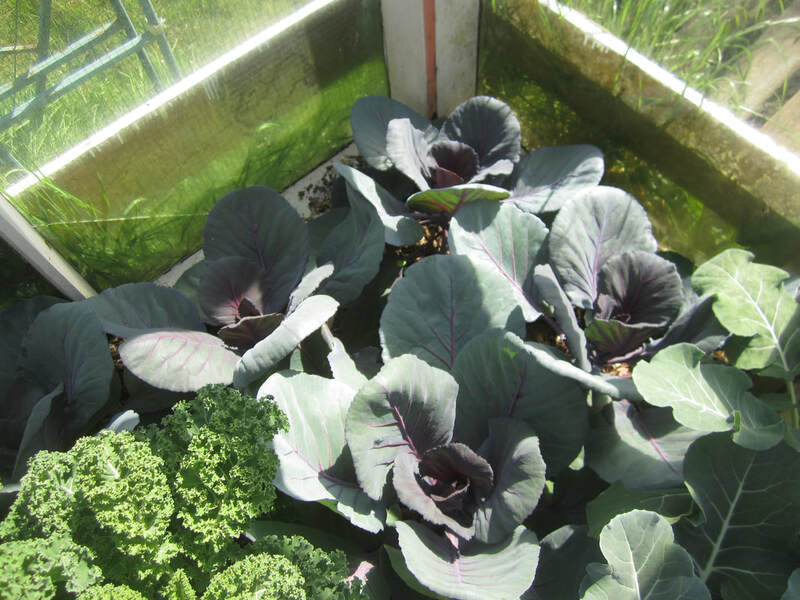 The kale and red cabbages both are looking gorgeous! Loving my daily kale addition to my breakfast smoothies (along with various other greens from the garden - NZ spinach, chickweed, puha, cornsalad, miner's lettuce etc). 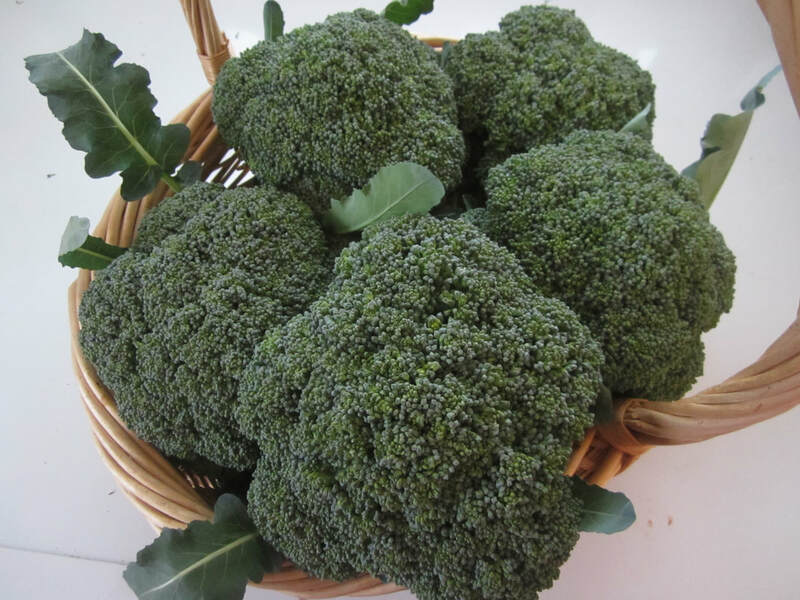 Conclusions: extra warmth makes a clear, huge difference in the growth and productivity of broccoli and other brassicas! 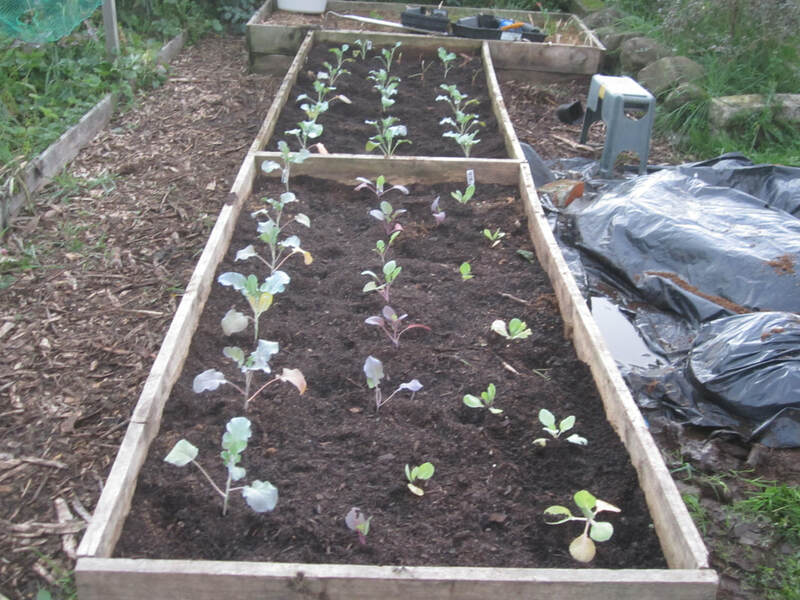 My intentions for 2018: Get brassicas in the ground outside by March, and also plant some in succession, including covering later ones to provide a warmer microclimate. 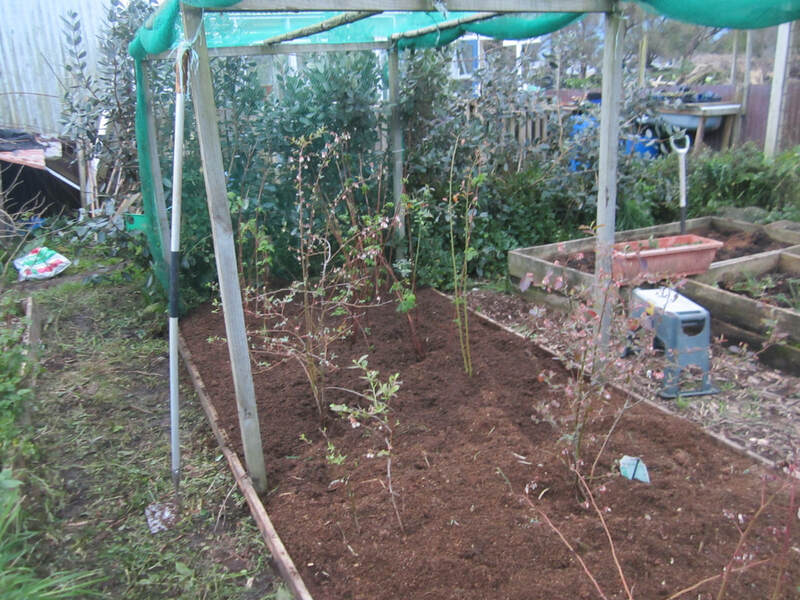 Use the greenhouse for extra plantings when the weather gets colder. 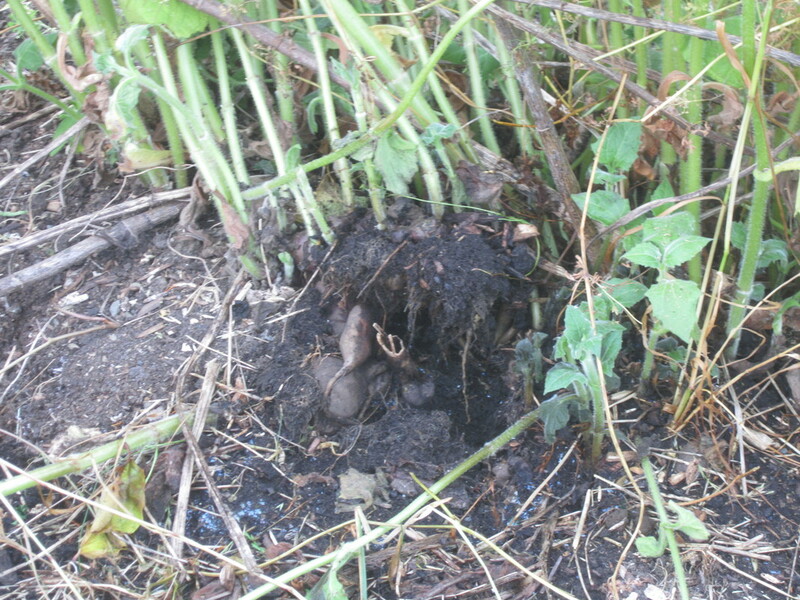 Group 1: planted 28th April, picked some tiny heads 4th August, few small shoots there after. No decent production. 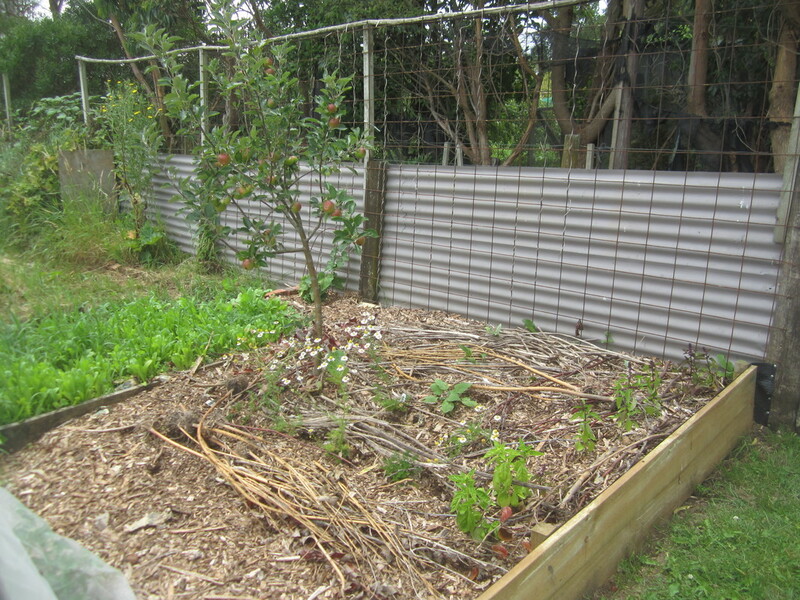 Group 2: higher raised beds. Planted 4th May. 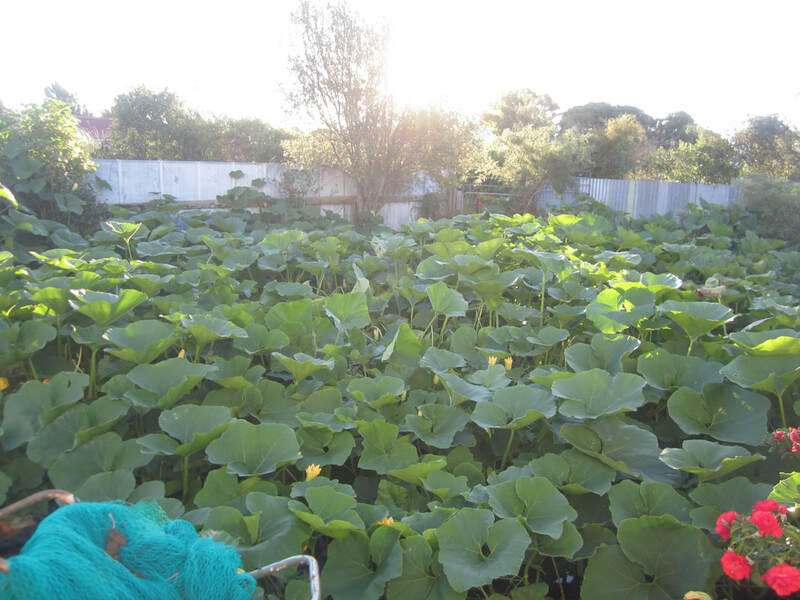 Picked main heads 24th August, lots of side shoots 5th Sept, pulled plants 14th Sept.
Group 3: Planted in greenhouse 5th June. Picked first group of main heads (large) on 8th Sept. As of 14th Sept, another group of main heads just about ready to pick within the next few days, and side shoots forming everywhere. 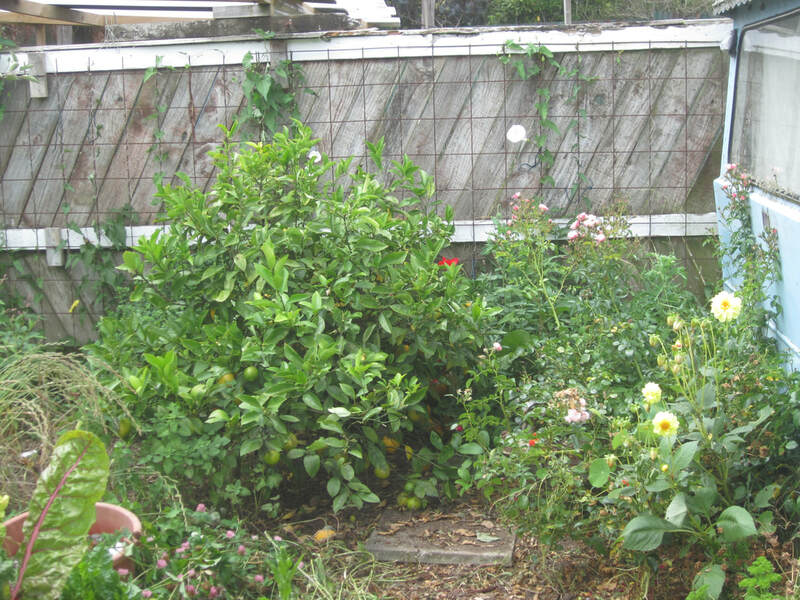 Though the list sounds long, it's actually somewhat narrowed down - for instance, not growing things I would normally grow that we use less of these days, or that are too much hassle for me at this time. Or I'm concentrating on favourite varieties rather than growing more diversity. 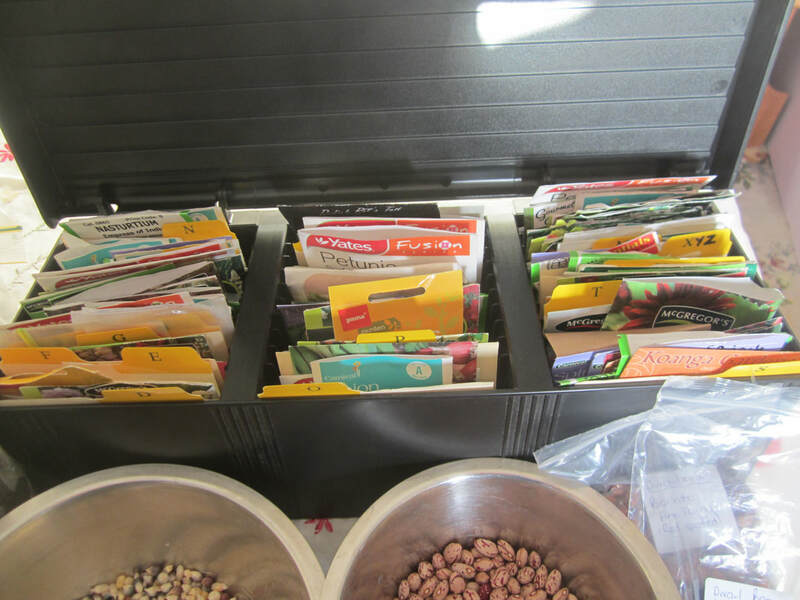 A common question is "How do you store your seeds?" My flatter packets of seeds are upright, sorted alphabetically, in two hard plastic cases designed for CDs (found at the op shop). 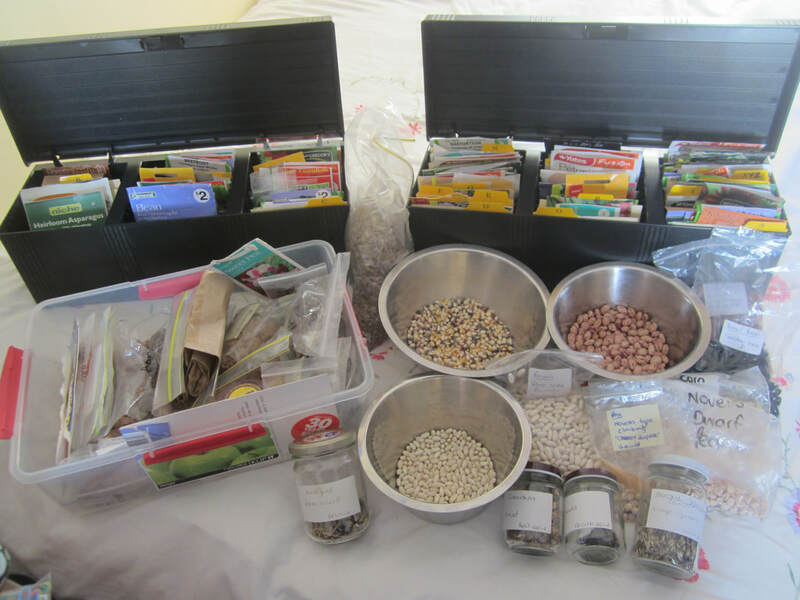 Bulkier saved seeds are kept in bags or jars, in a drawer and/or stacking plastic containers. I also freeze some. In theory, I'd freeze a supply of most seed that is important to me, as this keeps it viable for much longer, but I'm not that organised yet.